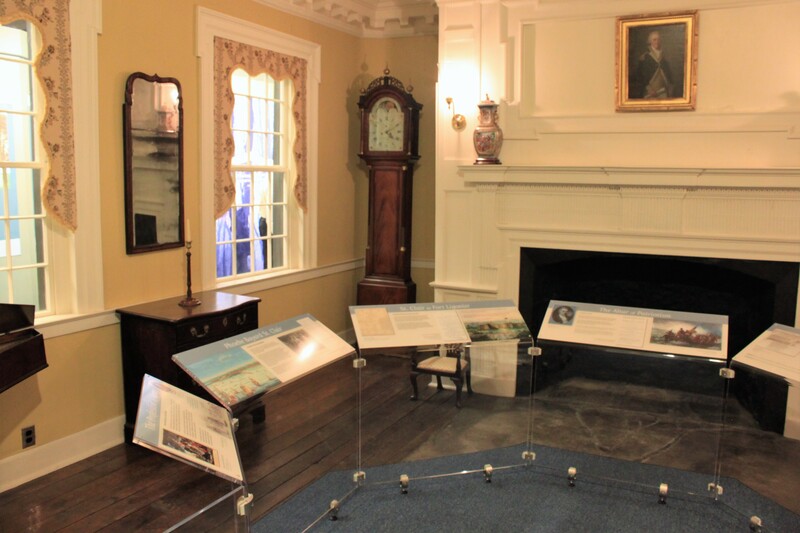 The Washington Headquarters Museum, constructed in the early 1930’s, is located in an historic building in the Morristown National Historical Park. 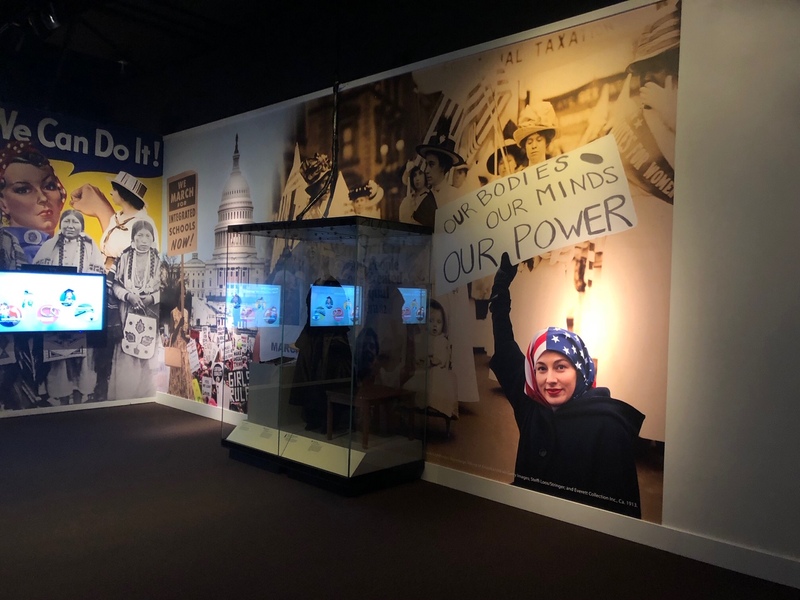 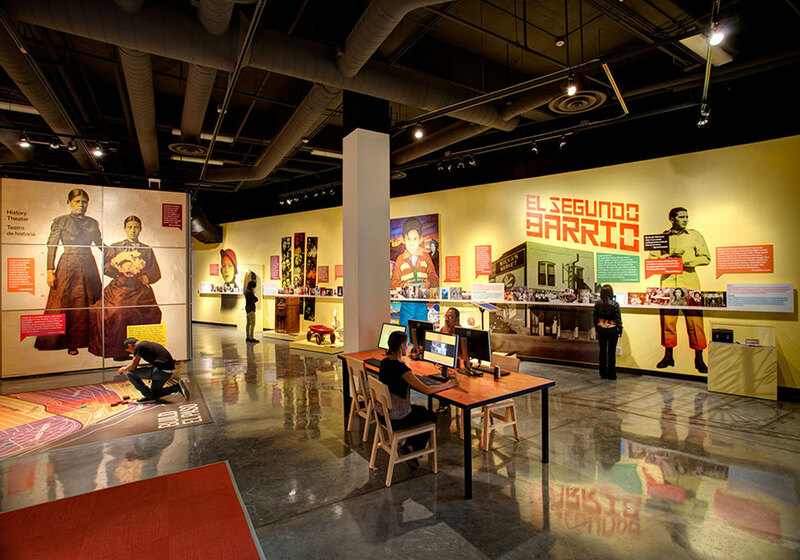 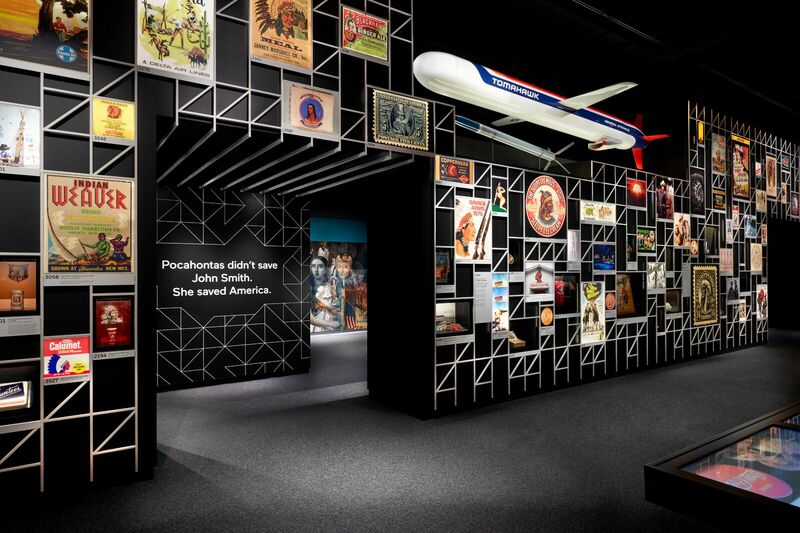 CMS provided project management, detailing, graphic production, fabrication, space fit-out, media production and AV systems integration, and installation of new exhibits for the Museum’s 2,000 sq. 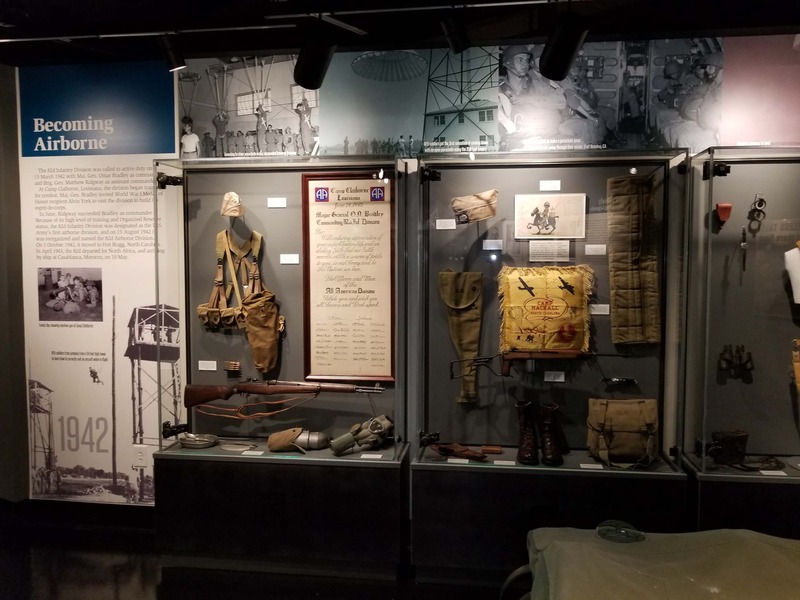 ft. Military Gallery and Discover History Center. 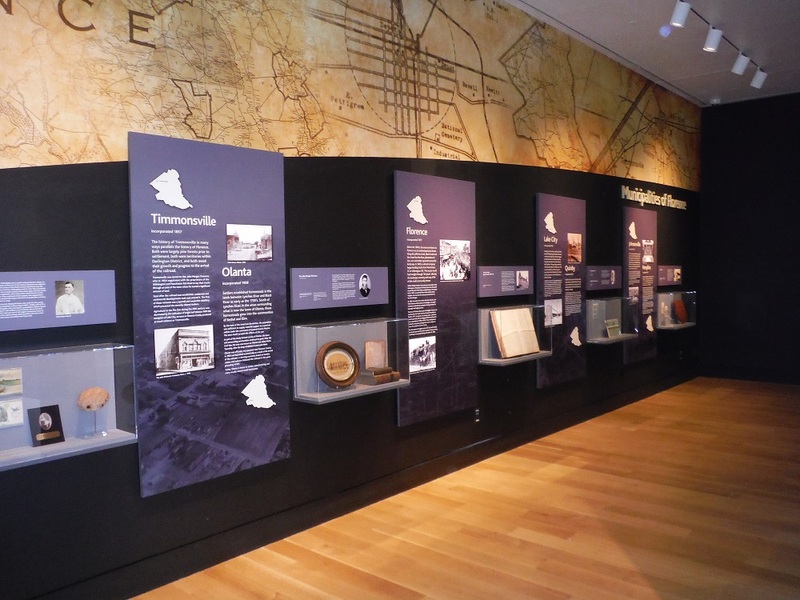 The exhibits were designed by Steve Feldman Design, LLC of Bethesda, MD. 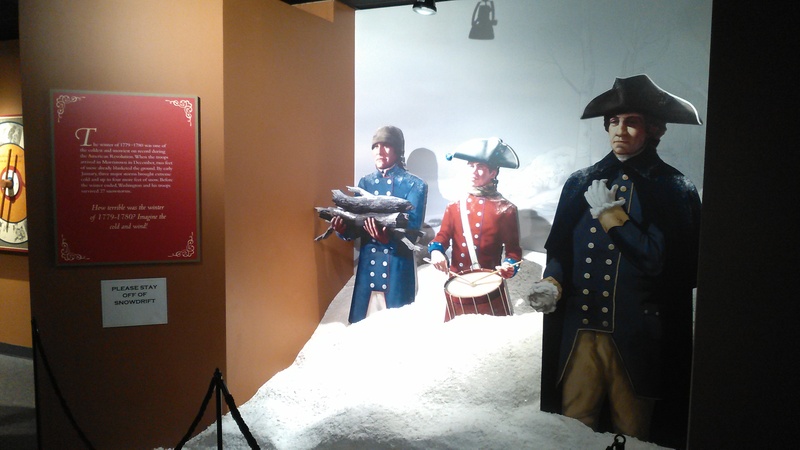 The exhibits tell the story of the ordeal faced by Washington and his troops as they camped through the coldest winter on record in an engaging and immersive experience. 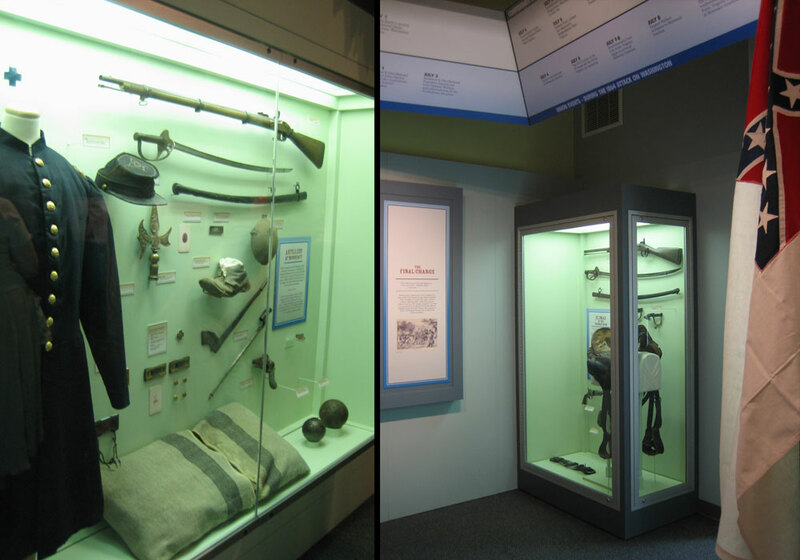 Beginning with the Military Gallery, visitors learn about the people and weapons of the Revolution. 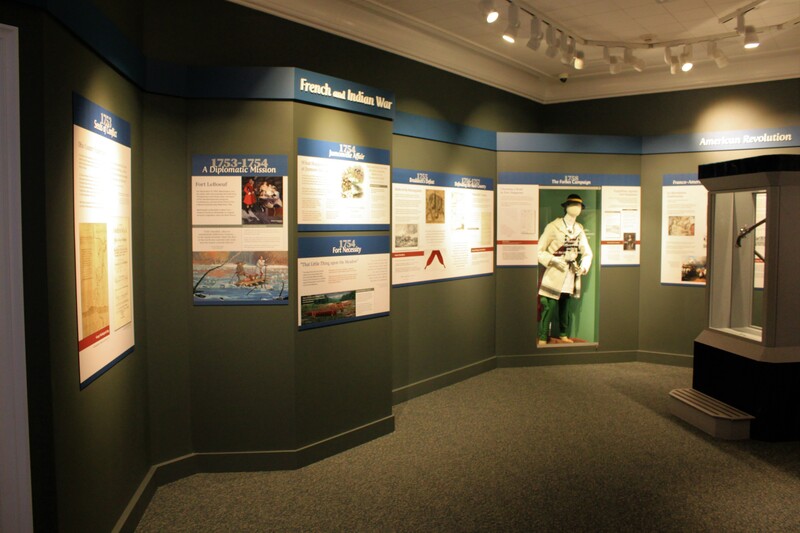 Historic artifacts and period paintings are displayed along with interpretive panels that explain the history and events. 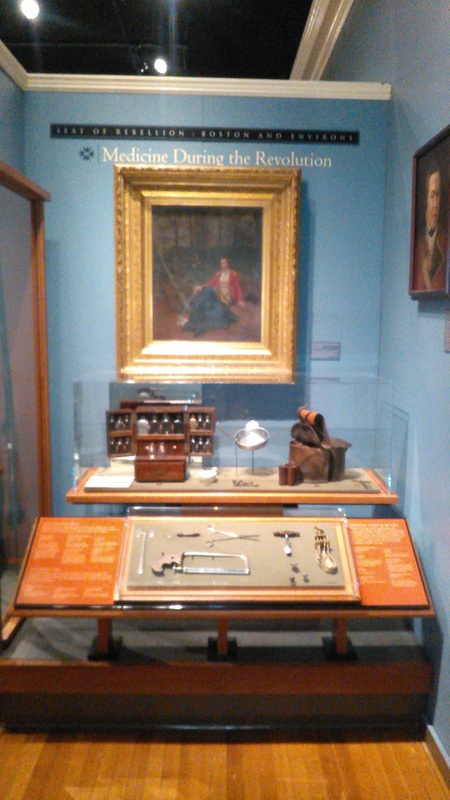 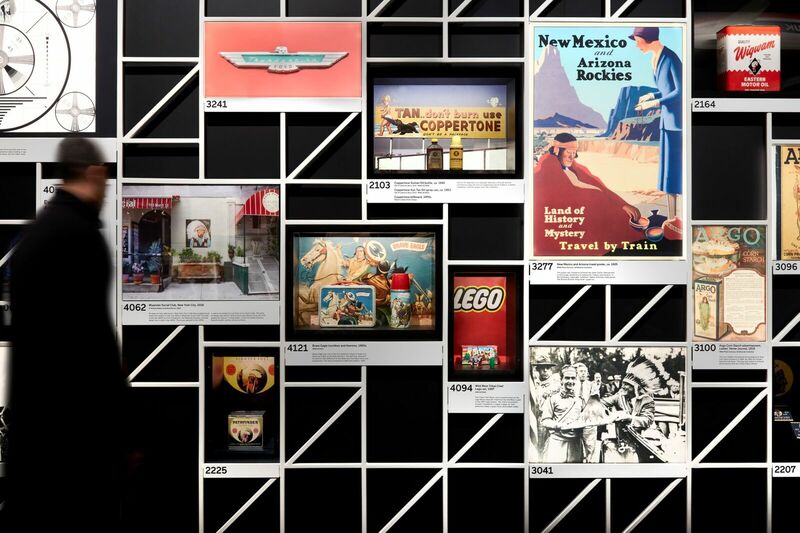 CMS provided artifact mounting services for the wide variety of original and replicated items. 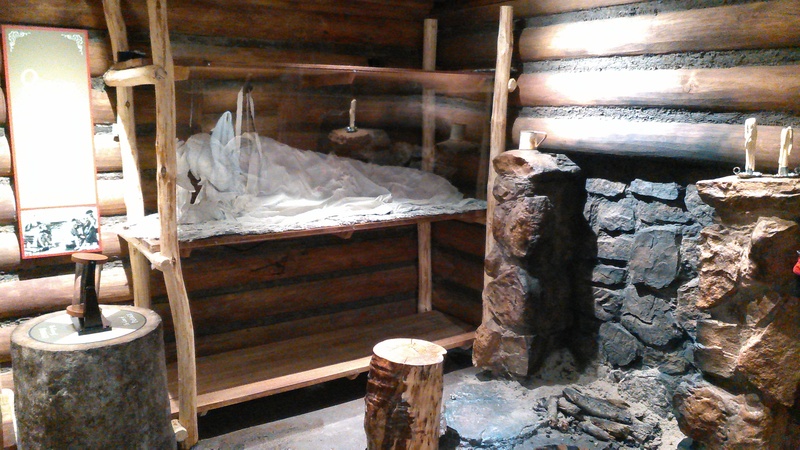 A full size replicated soldiers hut complete with bunks and life cast figures highlights the lower level Discovery History Center work. 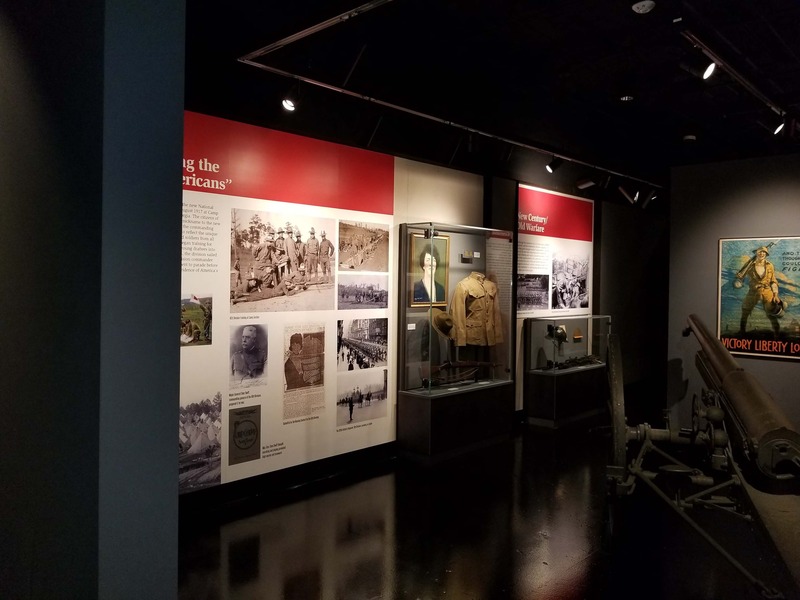 Interactive exhibits allow visitors to understand the logistics needed to feed and house the troops, the hardships endured by the soldiers and the strategy of fighting the war against the British. 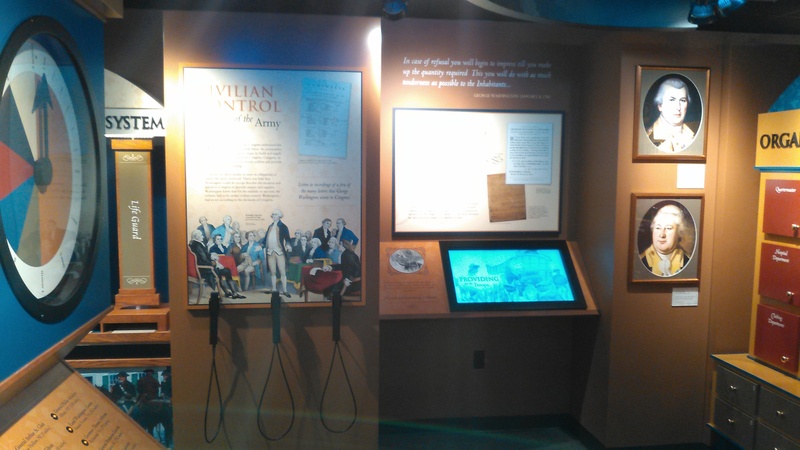 Mechanical interactives enable younger visitors to experience the weight of a soldier’s pack and the challenge of shouldering a heavy musket. 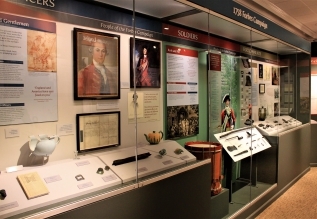 Typical rations are exhibited in a revolving display so the meal served to a regular soldier can be compared to that of an officer. 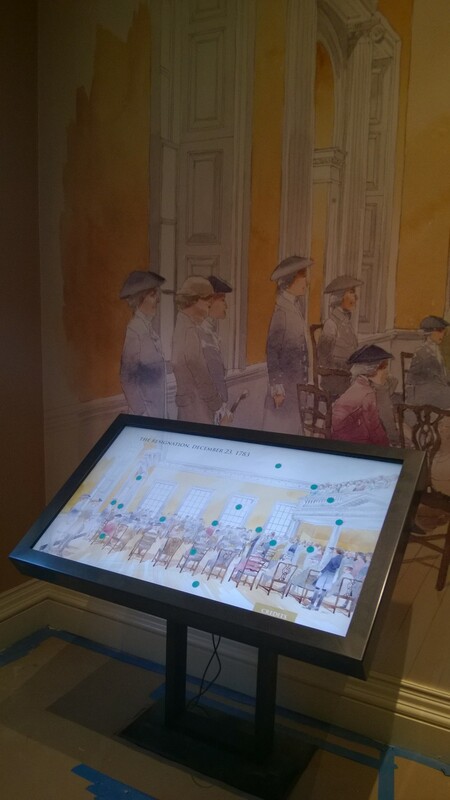 Communications between General Washington and his armies is explained through a unique interactive in which visitors “stamp” a letter that is then sent across a moving LED message display. 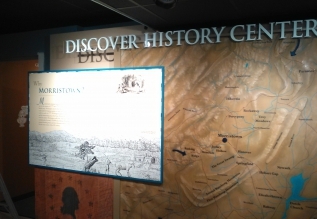 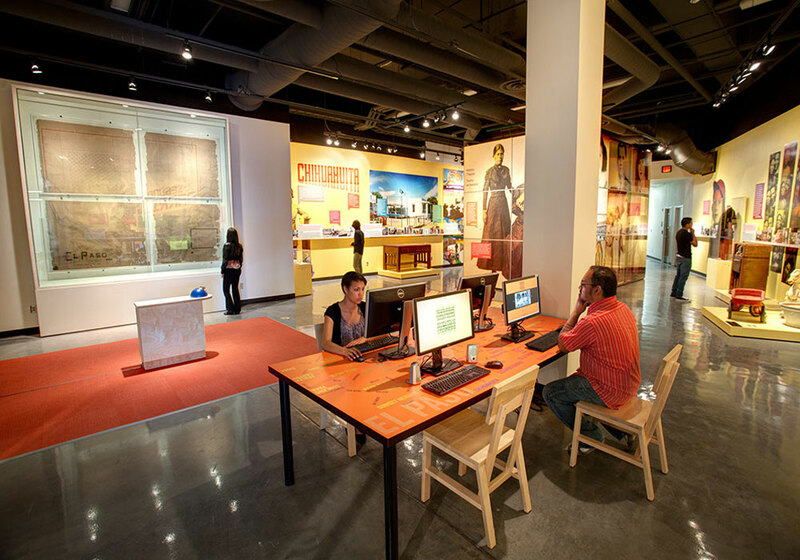 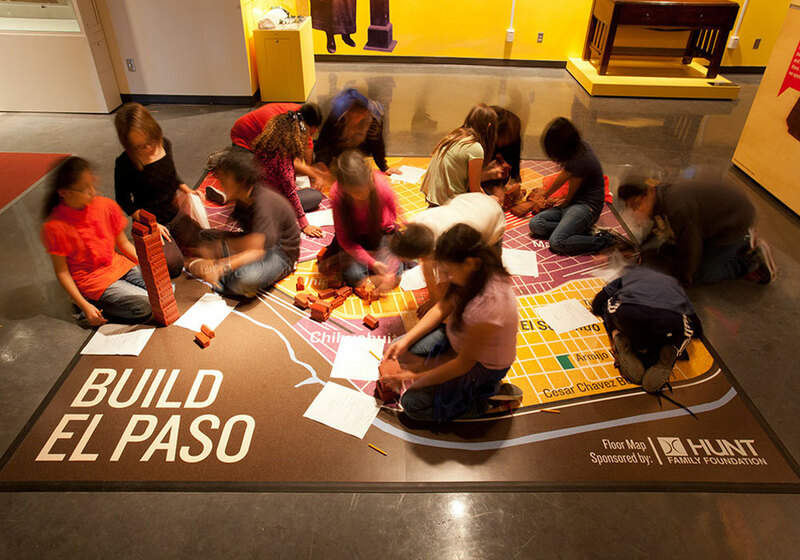 The entire Discovery History Center experience is filled with hands-on activities that connect people to the history rather than a static display of objects and images. 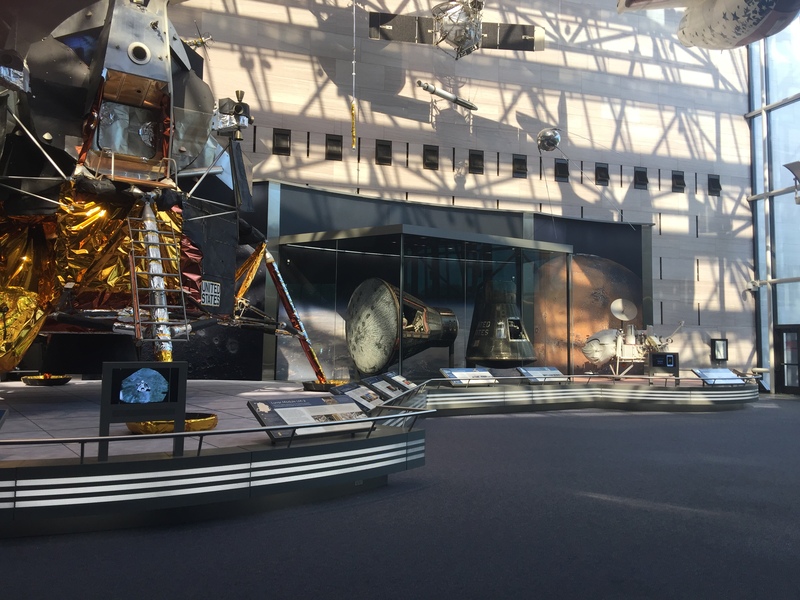 CMS met the challenge of detailing and fabricating durable exhibits that withstand the rigors of daily use and are easily maintained by the Park staff. 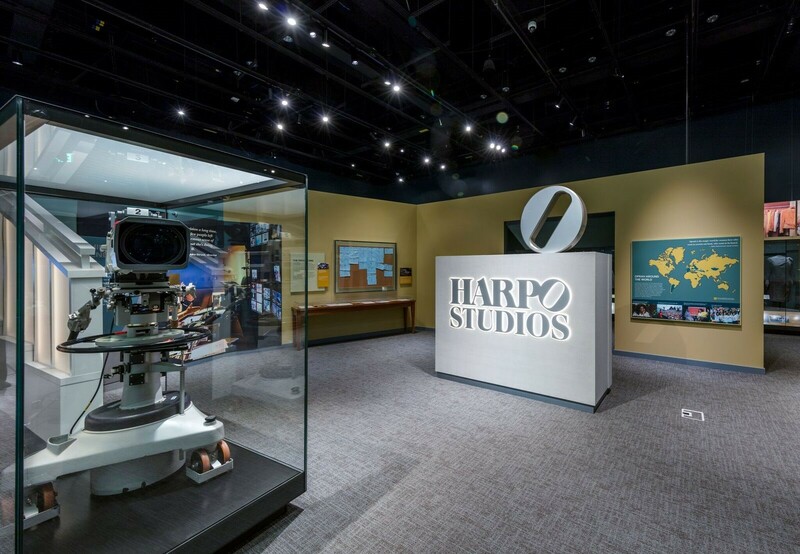 Hillmann & Carr, Inc. of Washington, DC was responsible for media production and A/V systems integration as a subcontractor to CMS. 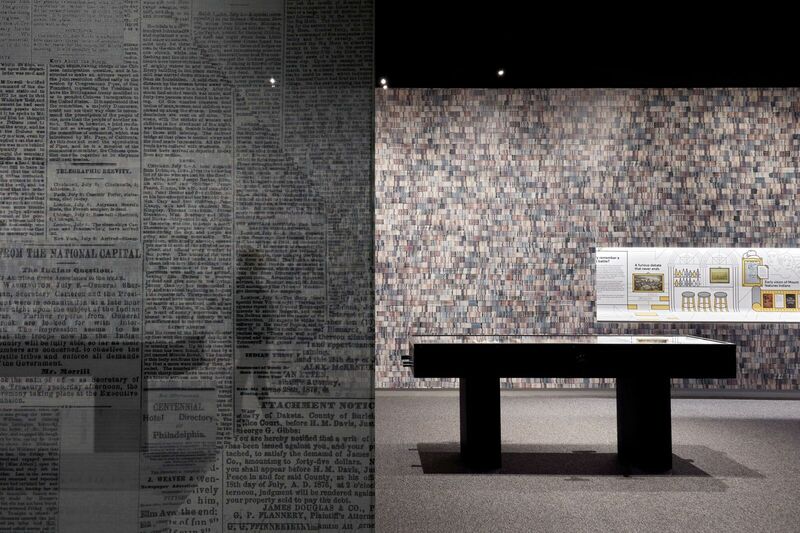 Media elements include interactives, ambient audio and an original introductory film. Tenacity is a special yearlong exhibition that explores little-known, captivating personal stories of real women in Jamestown and the early Virginia colony and their tenacious spirit and impact on a fledgling society. 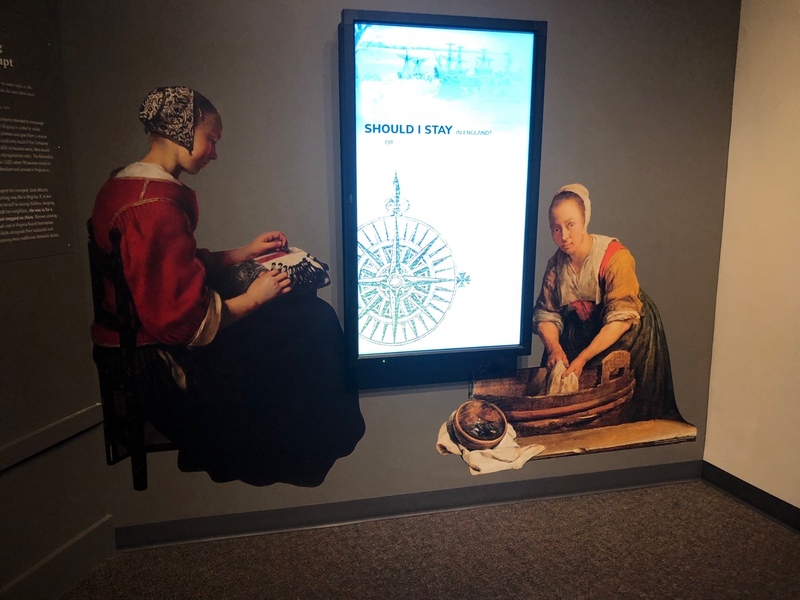 This story-driven exhibition features artifacts, images and primary sources - some on display in America for the first time - to examine the struggles women faced in the New World and their contributions. 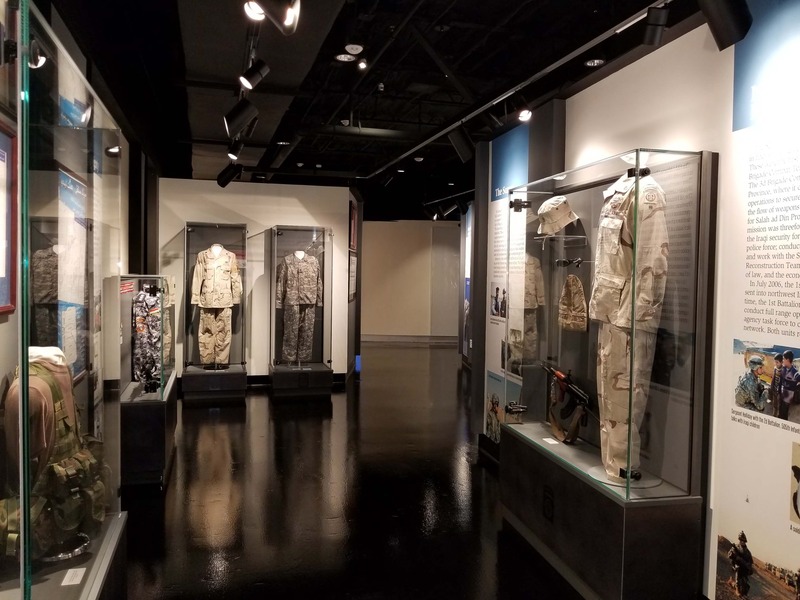 CMS provided project management along with detailing, space fit-out, exhibit fabrication, graphic production, artifact mounting and installation services. 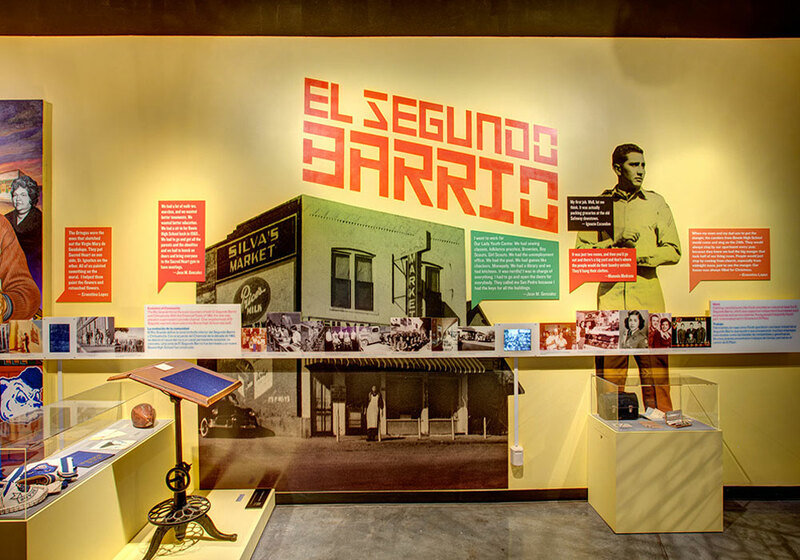 The exhibit, designed by Riggs Ward Design, includes large scale photomurals and a wide variety of other graphic elements including banners, star riser graphics, dimensional lettering, interpretive panels and labels. 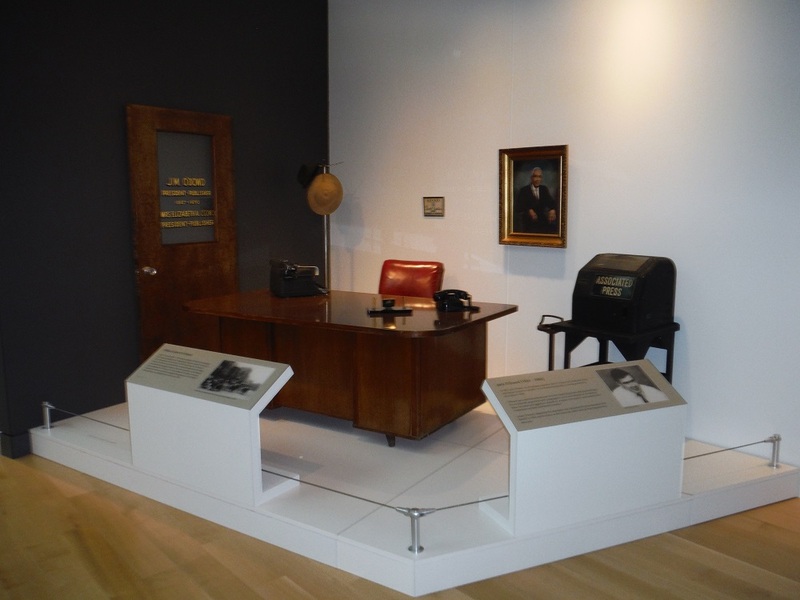 Exhibit work was closely coordinated with AV to provide for mounting of equipment and housings for monitors. 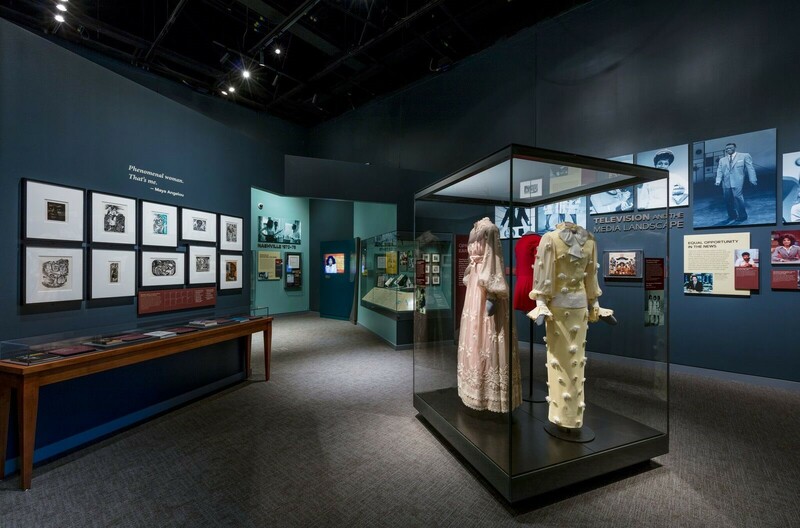 Over 100 artifacts are displayed in numerous cases including many delicate fabric items. 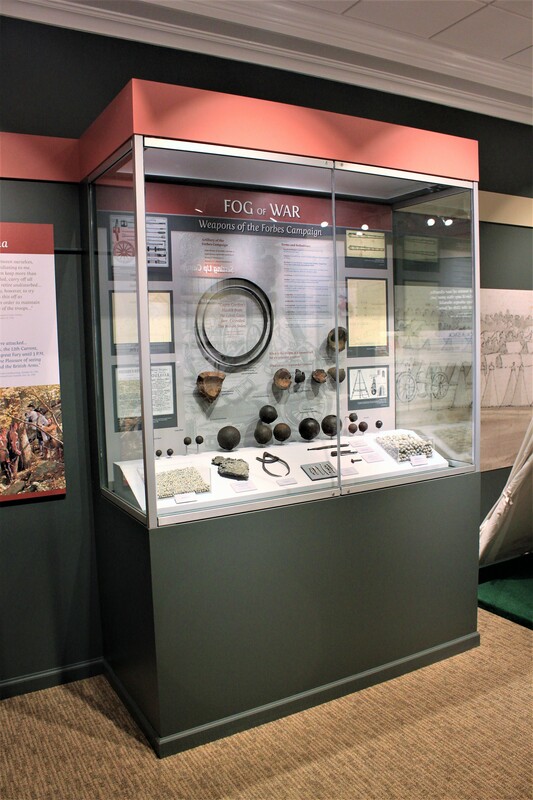 The artifact team worked closely with the registrars to develop final case layouts and fabricate custom mounts to provide for safe and attractive display of the objects. 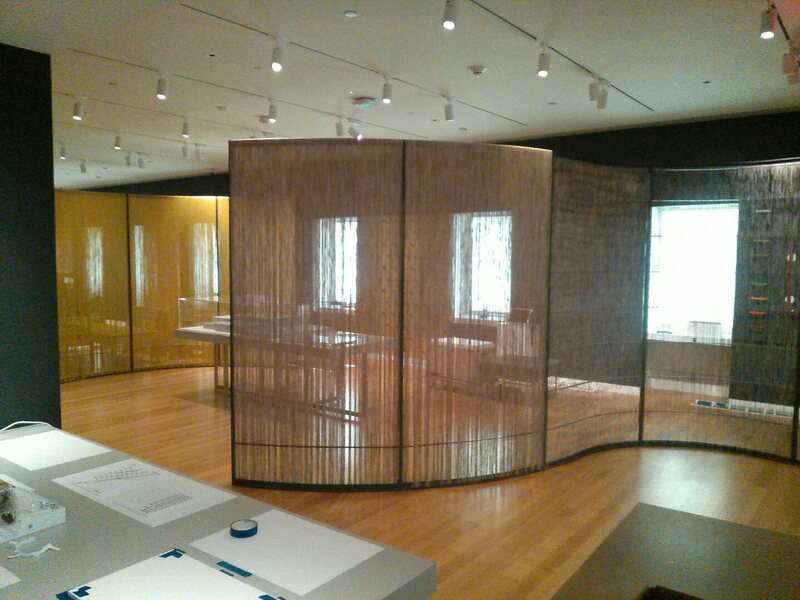 So what do you say when the Smithsonian calls you up and asks if you are interested in fabricating over forty, over sized, custom, curved, steel structures that you will then hand wrap with approximately 40 miles of specialty recycled plastic thread from Europe? 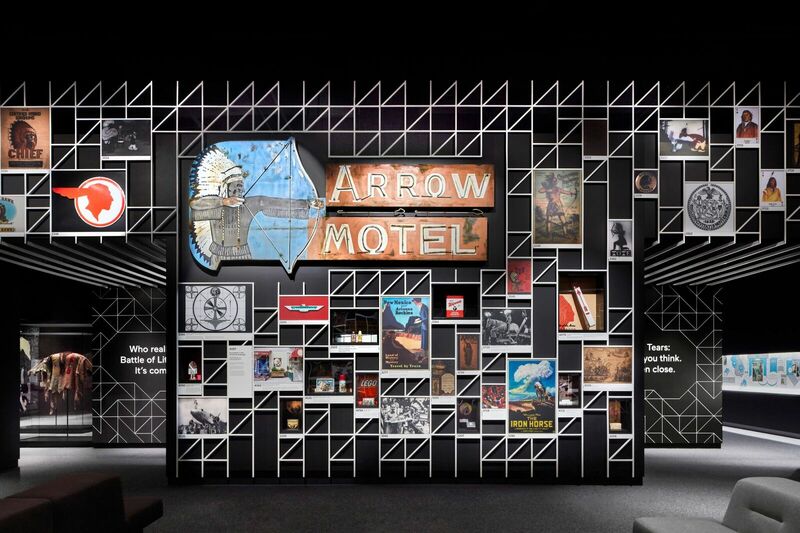 And ask if you can do it all in 7 weeks including installation at the Cooper Hewitt Museum on the Upper East Side in New York City? 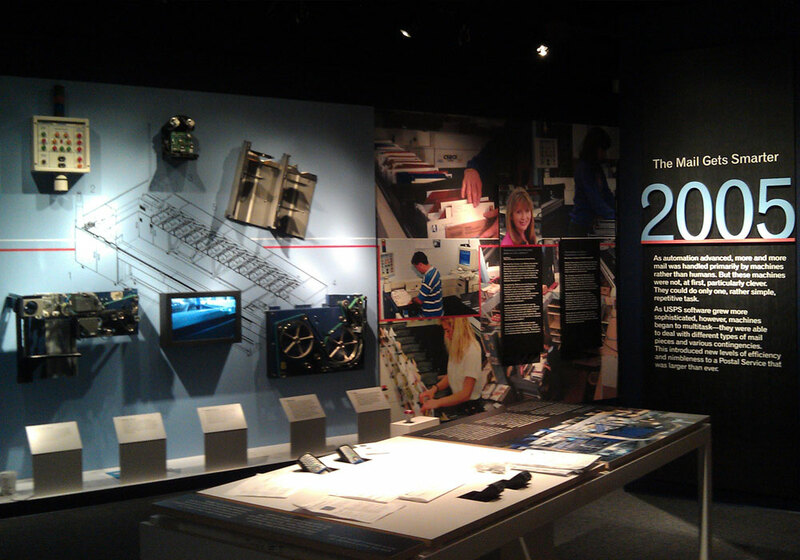 All we could say is that CMS loves a challenge! 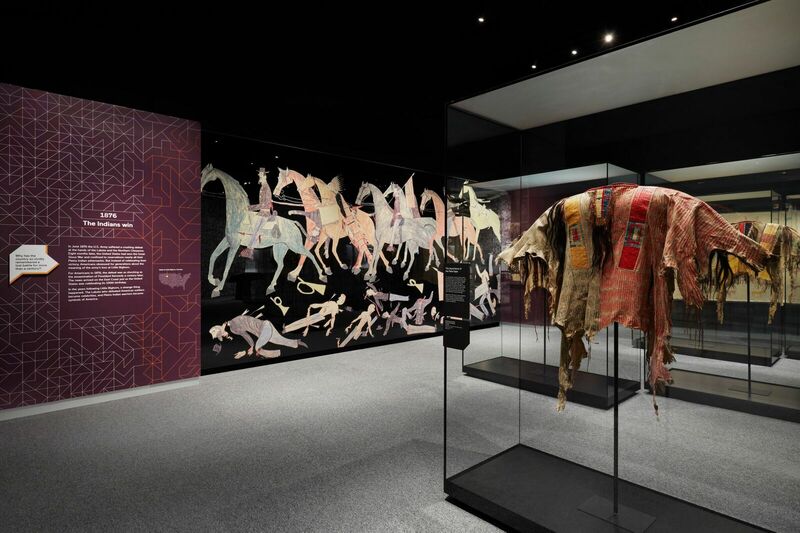 Having just come off the beautiful and critically acclaimed “Americans” project at the Smithsonian Institution’s National Museum of the American Indian designed by Studio Joseph of New York, we were excited that the Smithsonian requested our services for their next creation at the Cooper Hewitt Museum entitled "The Senses: Design Beyond Vision". 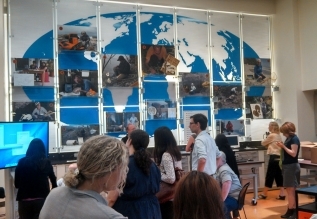 After an initial meeting, CMS dove into the challenge. 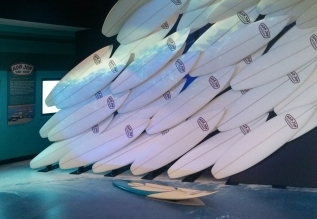 Making the frames from steel (needed to withstand the tensions that were going to be placed on the units) required special laser-cutting of all the custom designed curved sections. 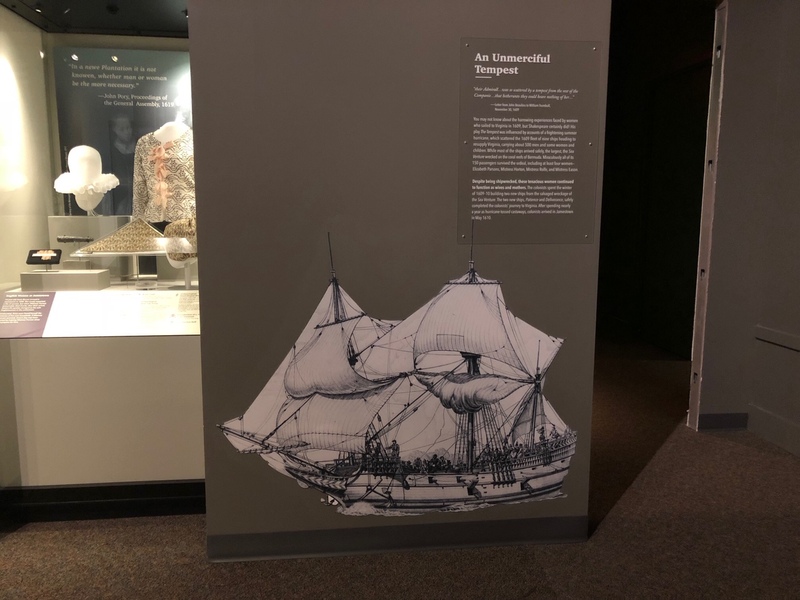 Given the short time frame, CMS had to work diligently with the designer to convert graphic files to a specific type that could be interpreted by the laser cutter. 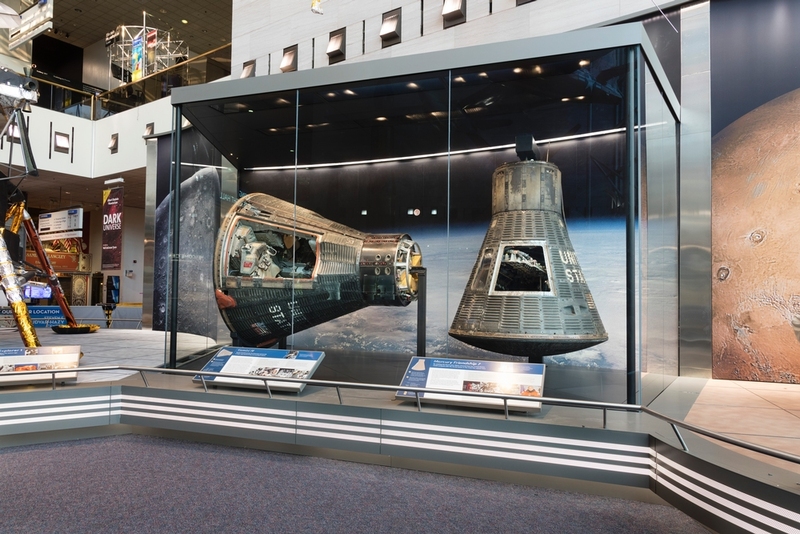 Included in this effort also was the task of a succinct naming system to make the pieces easily identifiable by the fabrication crew who welded and assembled them. 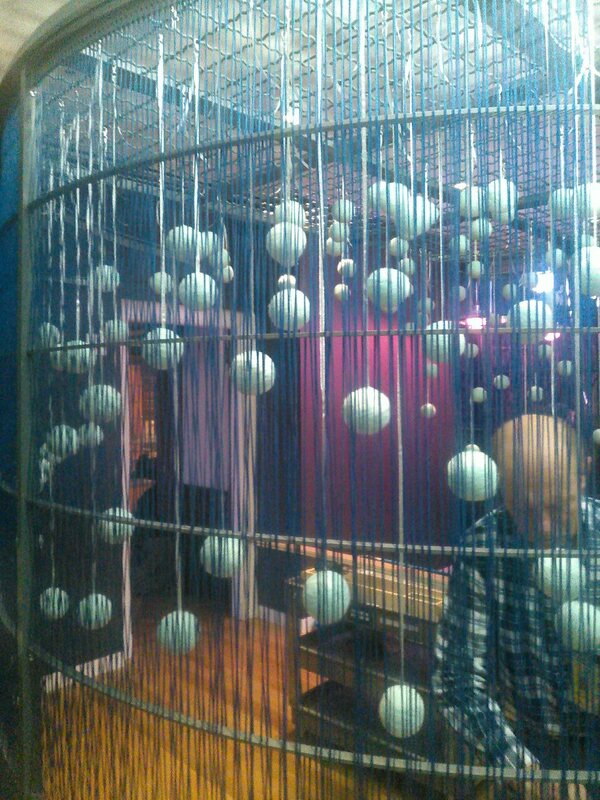 Next, CMS had to move on to the plan for threading. 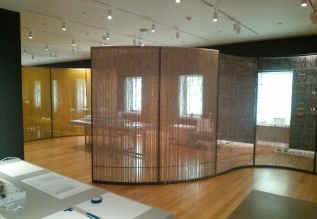 The recycled material, similar to what is used to produce lawn furniture, came in several different colors and patterns. 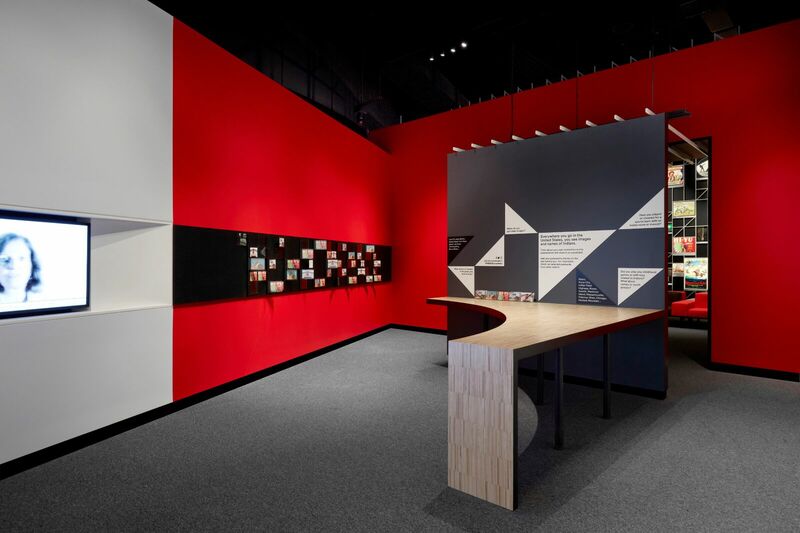 Each section of frame had a specific sequence of colors with each pass having four threads that could be all one color or a variation of colors. 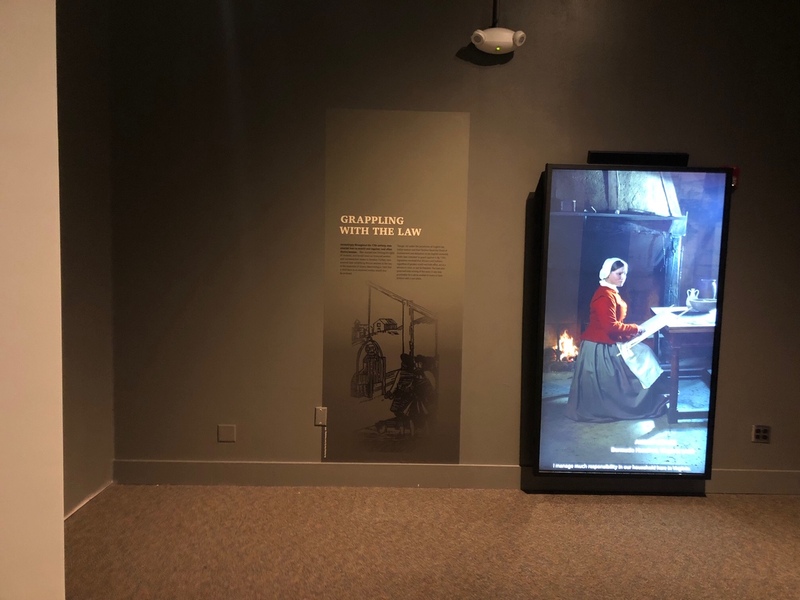 Pulling threads from more than one spool at a time proved difficult so the fabrication team calculated the lengths and colors required for each area of frame, then built a motorized system to re-spool up to four different spools. 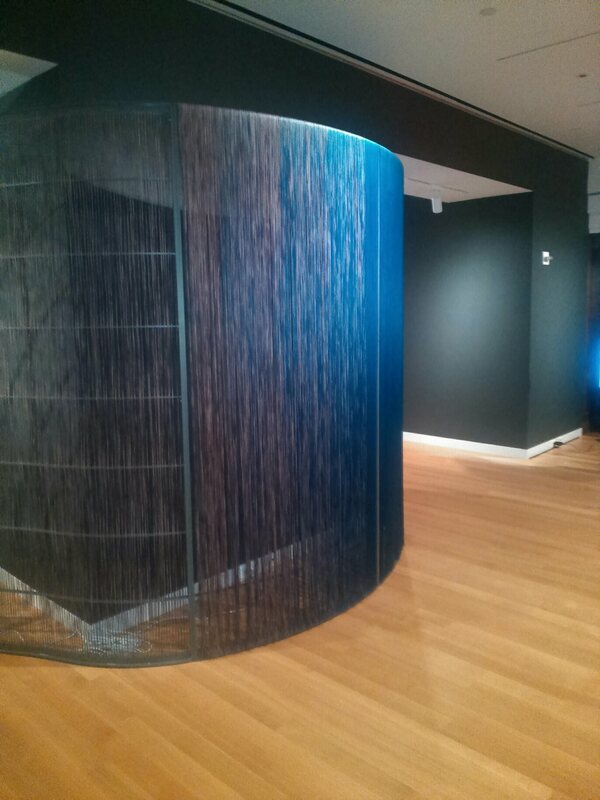 Fabrication also laboriously hand wove through roughly one half of the frames. 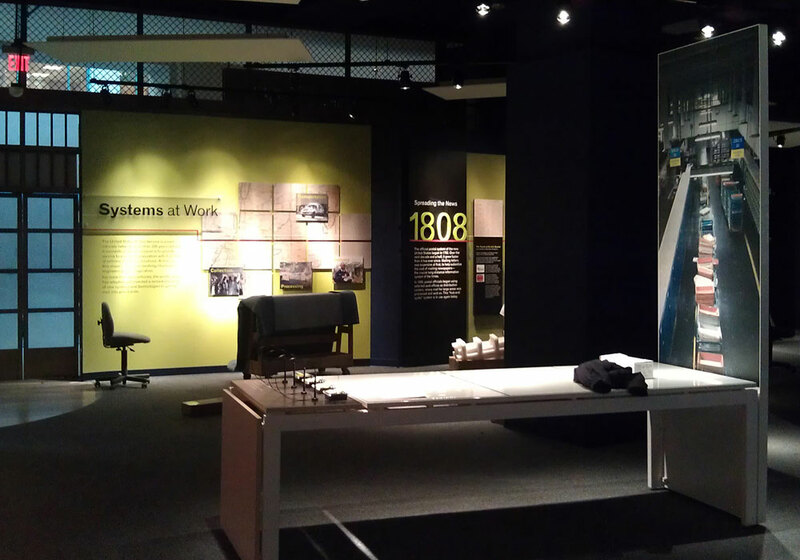 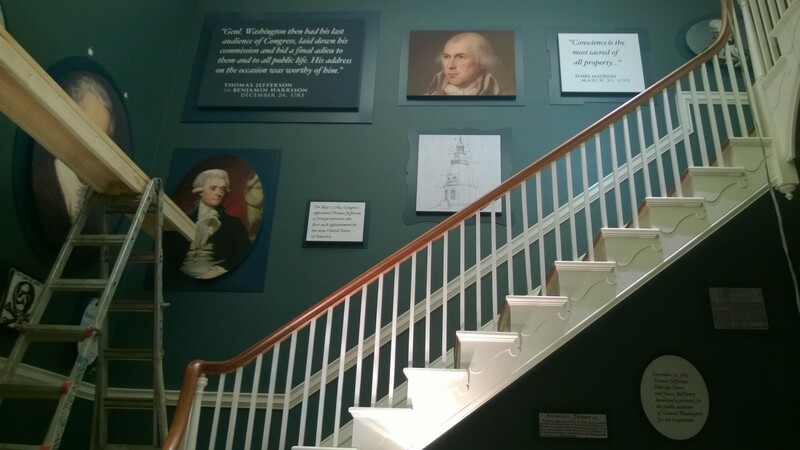 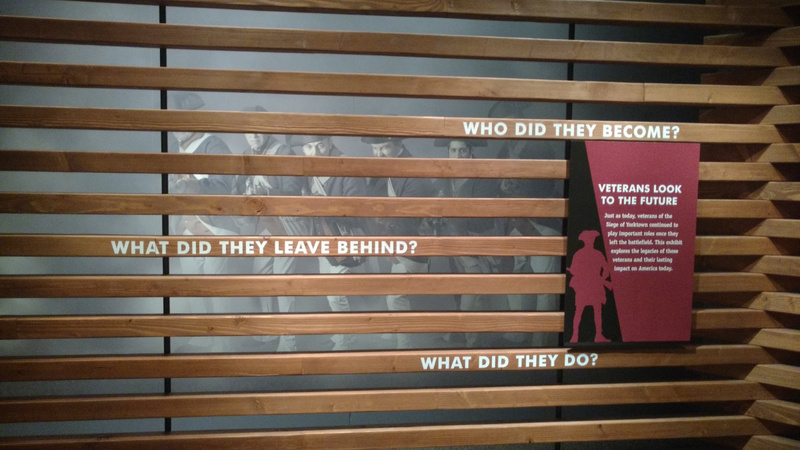 After successfully detailing, fabricating and installing AfterWARd: The Revolutionary Veterans Who Built America exhibition at The American Revolution Museum at Yorktown, the Jamestown-Yorktown Foundation turned to CMS once again to carry out their vision. 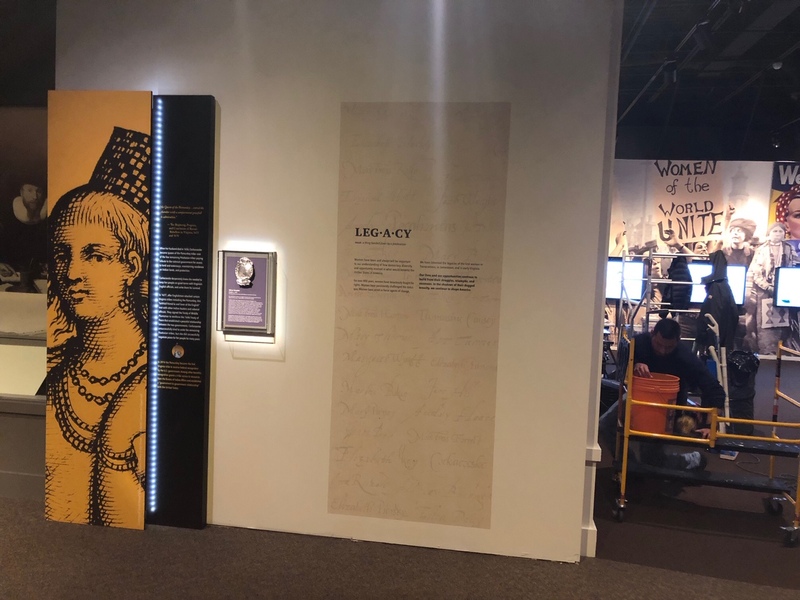 CMS gladly accepted the challenge and opportunity to produce another dynamic exhibition which so poignantly tells the story of such an important time in history. 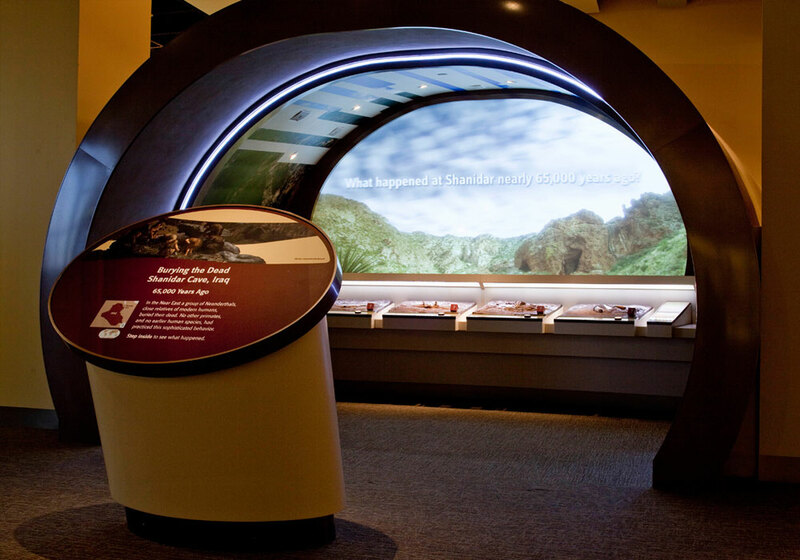 CMS detailed all exhibit components, which were then crafted by our graphic production artisans and skilled fabricators. 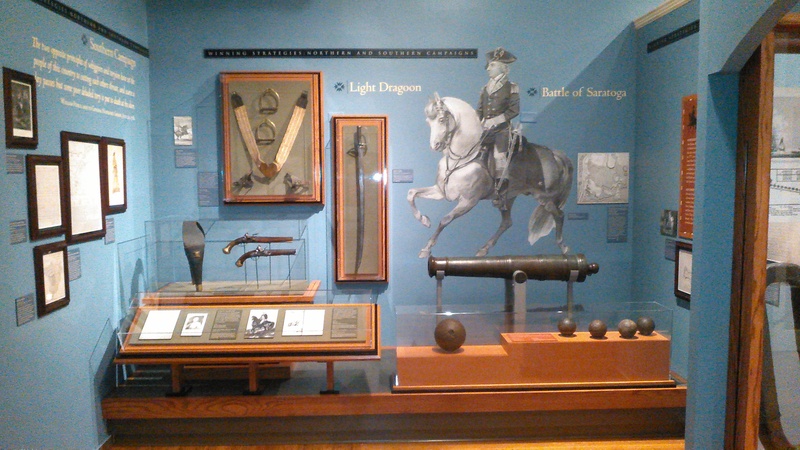 Of special note were the museum-grade artifact cases and specialty mounts, which were delicately built to display the unique artillery pieces which included: ● a British Light 3-pounder bronze field cannon ● a “La perileuse” French 4-pounder bronze field cannon ● a British 12-pounder bronze “Lafayette” cannon ● a American 6-pounder iron cannon ● a “La Bellone” French 4-pounder bronze batallion cannon. 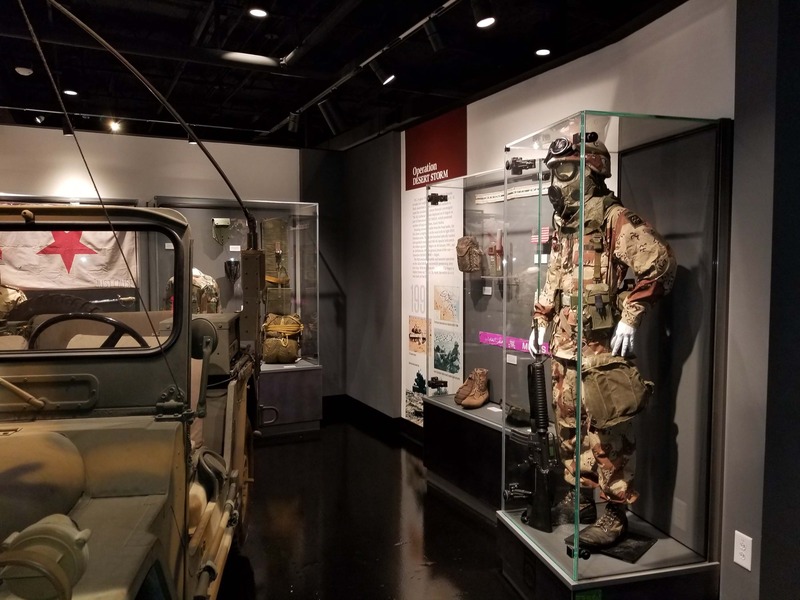 CMS’s AV integration services required close coordination with the AV hardware provider and software developer to properly fit equipment into tight spaces in the exhibit. 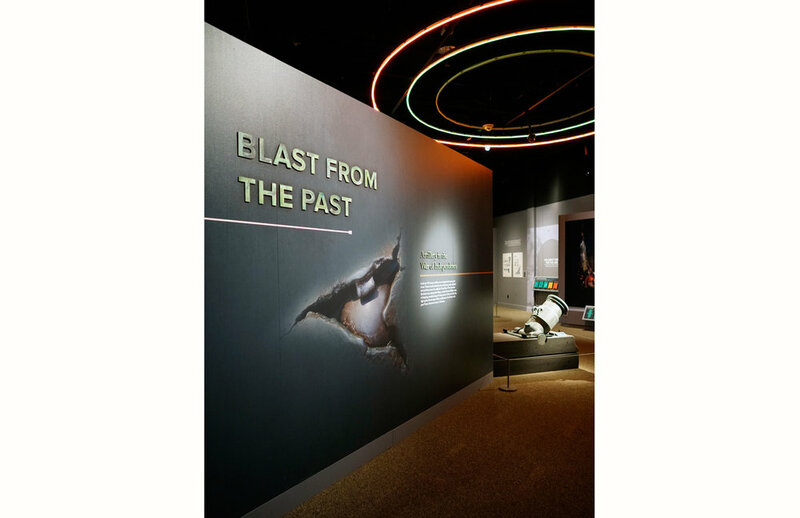 Issues such as power feed locations, locations of controls, and access to controls needed to be carefully examined and planned out. 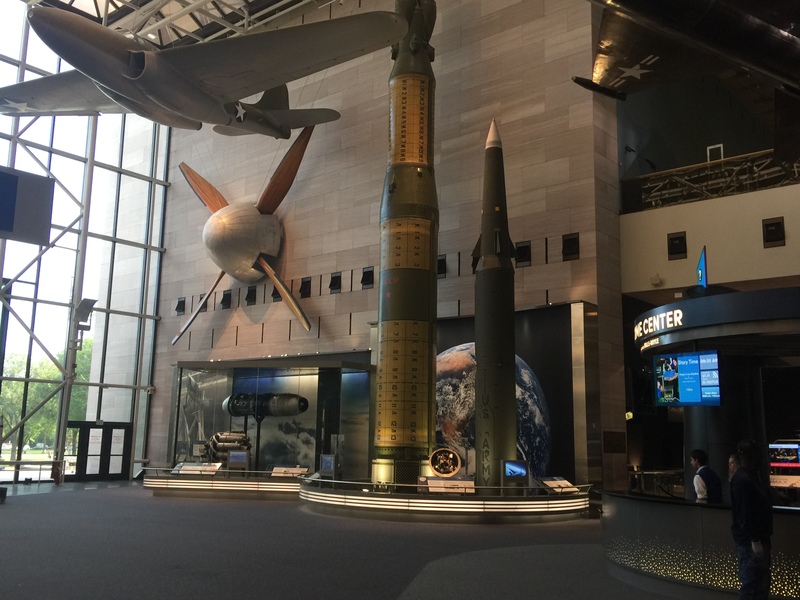 Our AV integration technicians carefully considered these for each location, and accurately fit and placed every component, insuring a smooth install and successful operation. 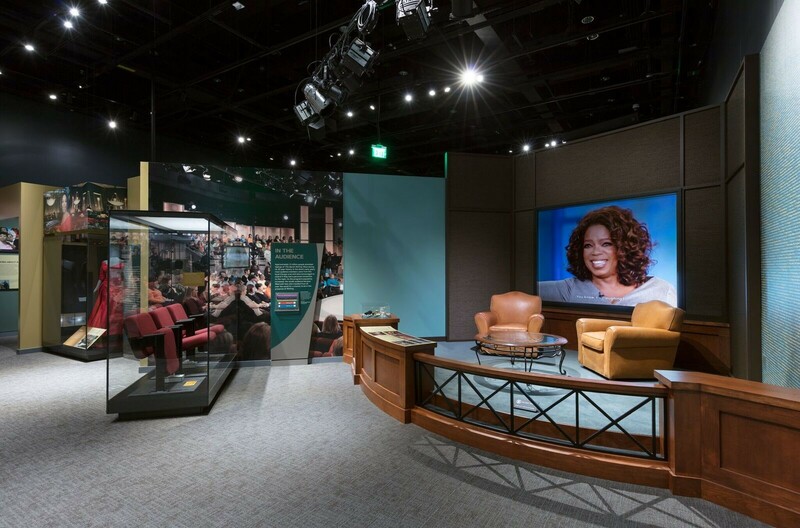 As an African American woman who founded her own media company and became a cultural icon watched by millions around the world, Winfrey harnessed the power of the media to break down barriers, empower herself, and inspire others. 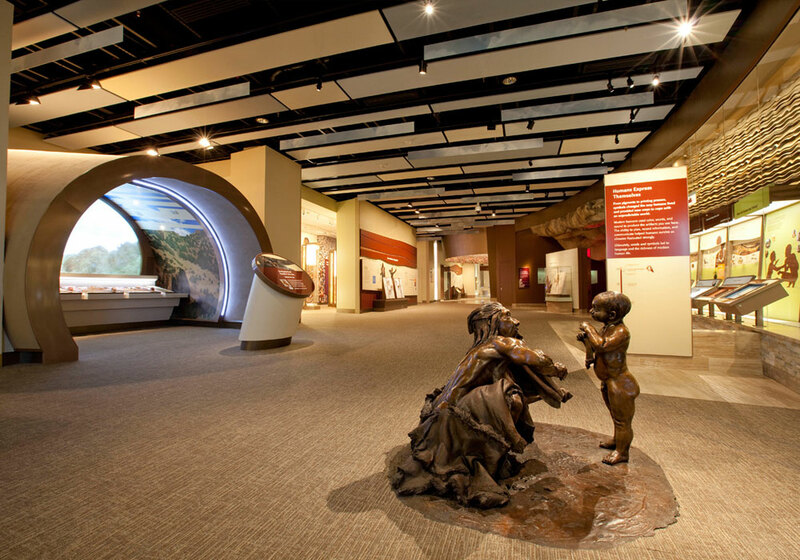 Capitol Museum Services was awarded the detailing, fabrication and installation of this new, 4,300 sq. 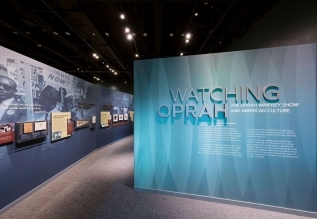 ft. special exhibit which recently opened at the Smithsonian Institution’s National Museum of African American History and Culture. 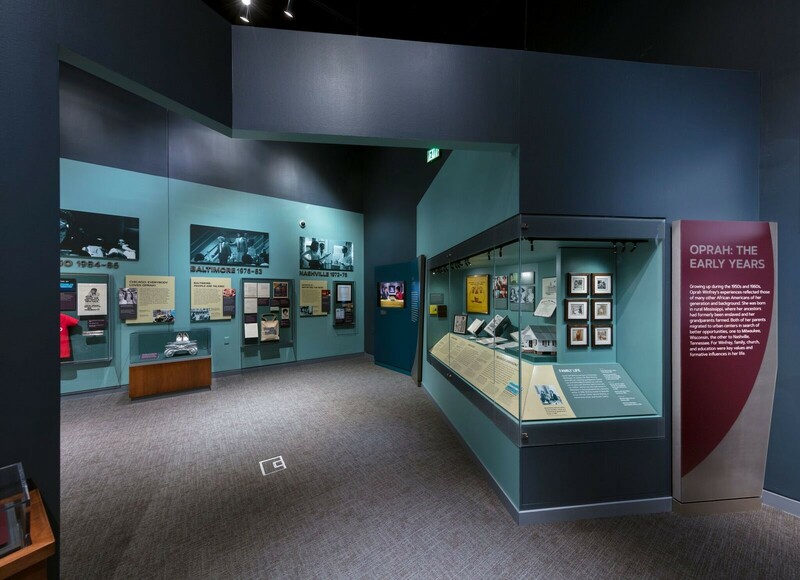 The exhibit space is divided into three distinct areas in which CMS fabricated all exhibit components encompassing custom casework and artifact mounts, artifact installation, graphic production and AV integration. 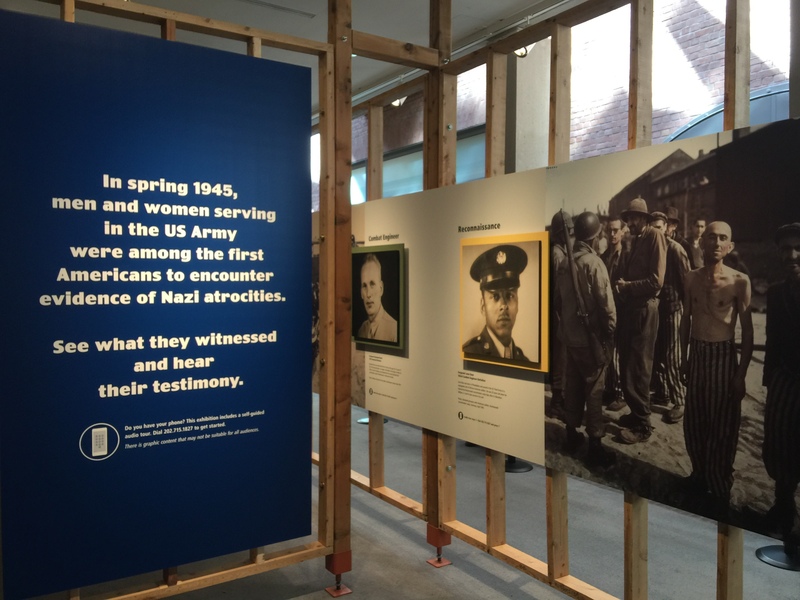 This special exhibition, “American Witnesses”, highlights the experiences of American men and women who saw first-hand evidence of Nazi atrocities. 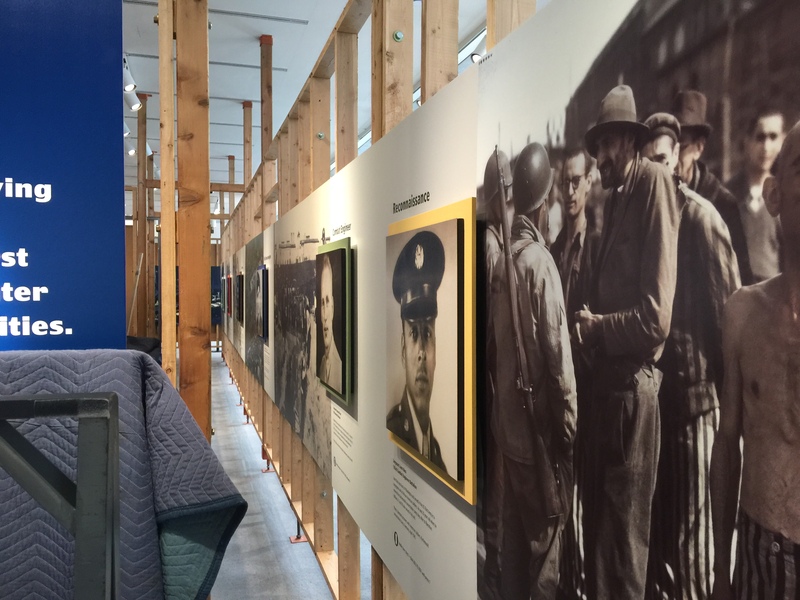 Using their oral and written testimony, photographs and film, it explores their reactions and efforts to expose and document Nazi crimes, and to nurse starving and ill prisoners back to life. 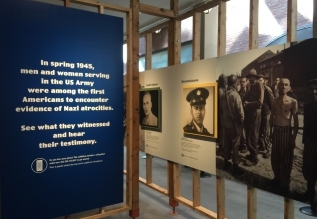 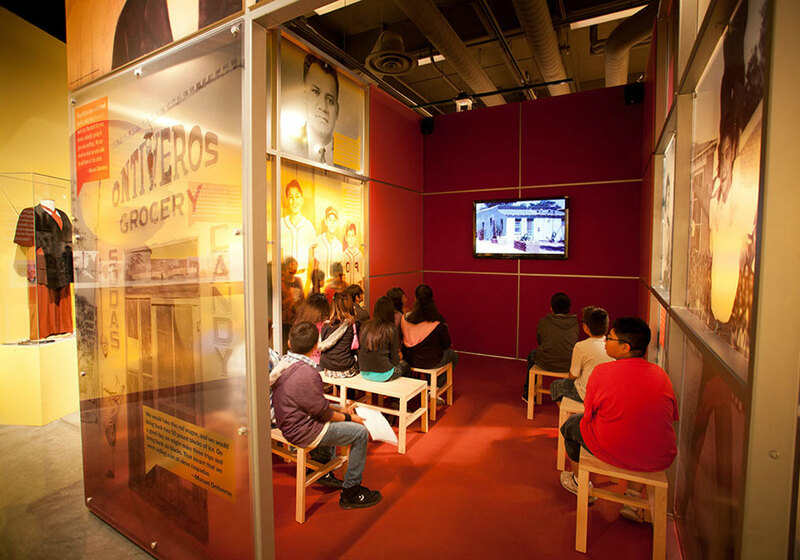 CMS was selected to update this exhibit at the USHMM. 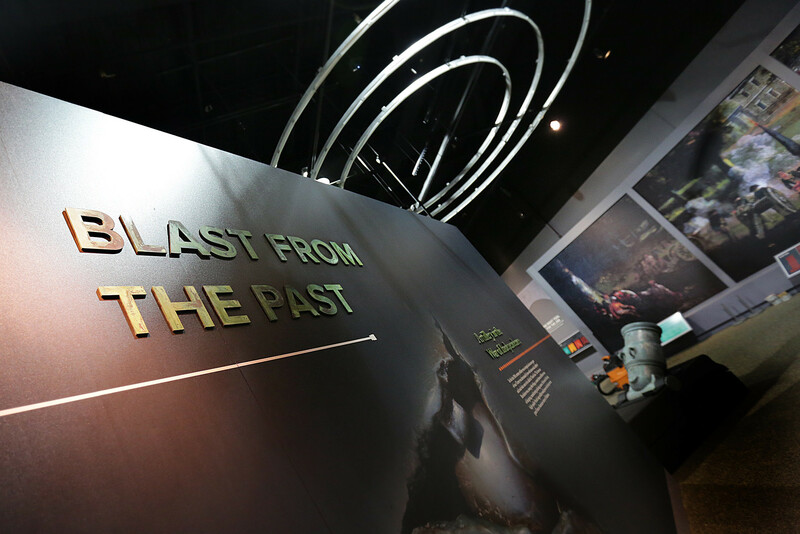 We worked closely with the exhibition team to identify the preferred printing and fabrication methods along with running several graphic tests in order to assure the client that the historical images would reproduce accurately. 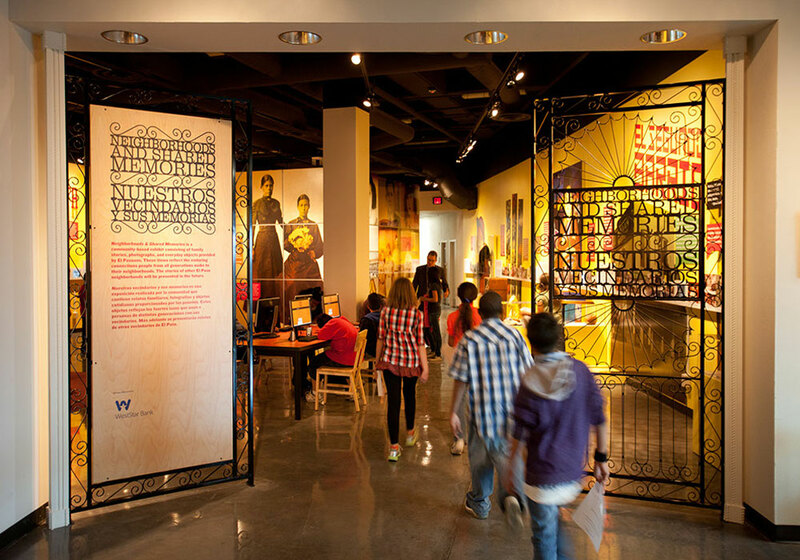 With a short time frame and demanding standards, CMS was able to accommodate. 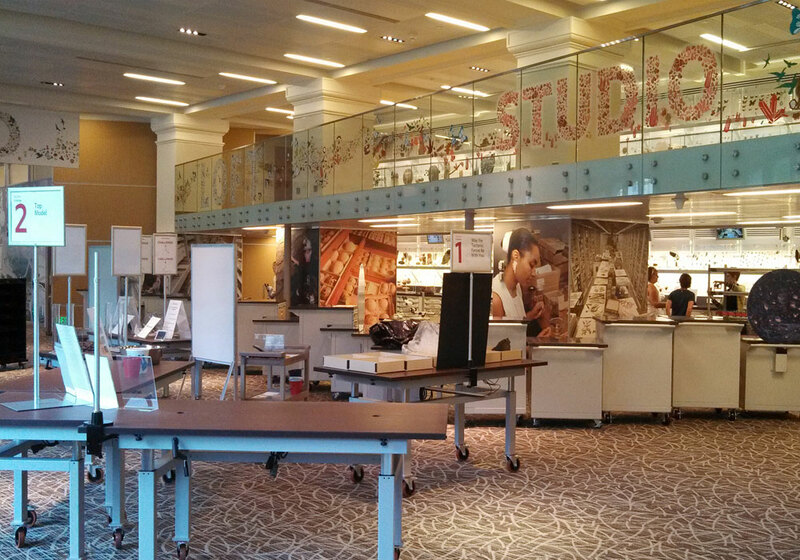 CMS has the equipment and experienced color management specialists capable of producing all graphics in-house. 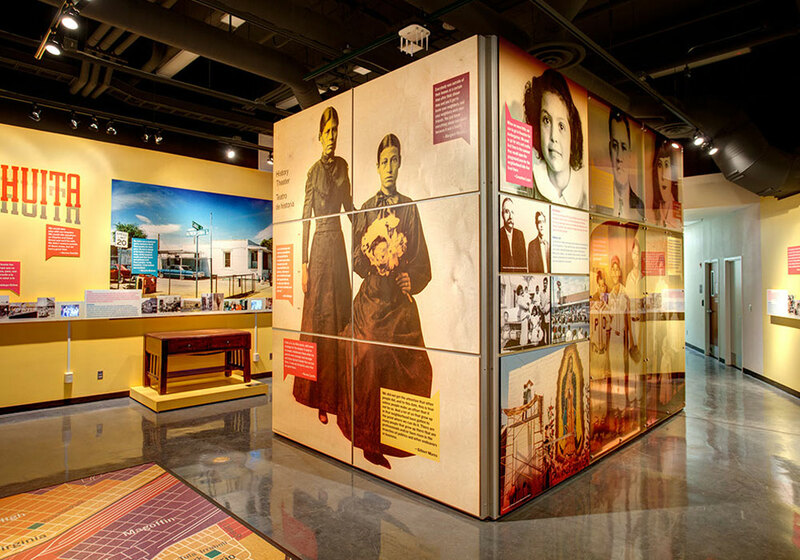 The large graphic panels were printed direct to PVC panels utilizing our 8’ wide AGFA Anapurna UV curable, direct-to-substrate, printer. 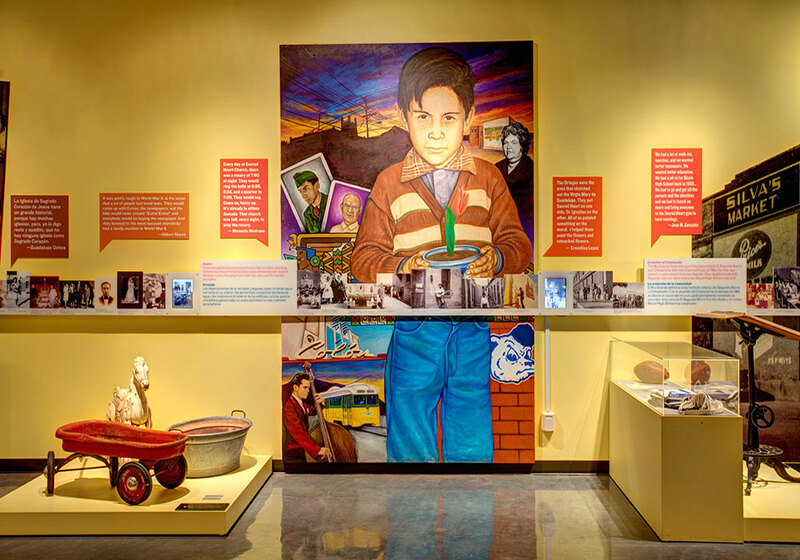 In addition to the many images and panels that were produced for this project, USHMM also approached CMS on a plan to temporarily cover hundreds of ceramic tiles in the area that have children’s drawings embedded in them. 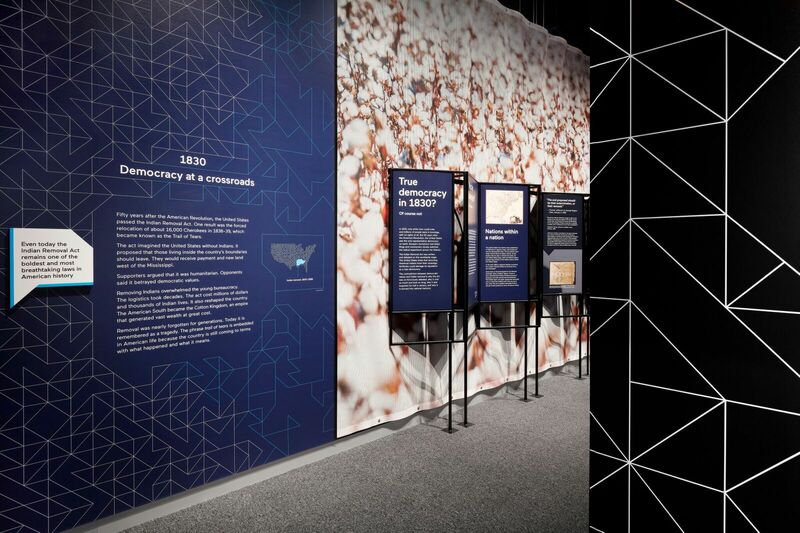 It was decided that those images did not correlate well with the atrocities of the new temporary exhibit so the decision was made to use a framing system with stretched fabric panels, fitted with silicon edging, designed to fit into channels in the extruded aluminum frames. 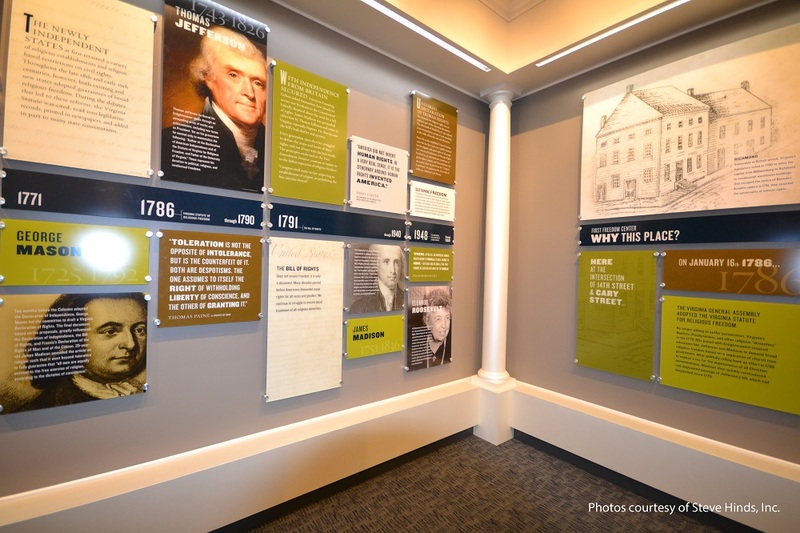 Taking paint samples from the gallery, CMS powder-coated the new frames to match the existing gallery trim, as well as, custom printed the fabric to harmonize the frames and surrounding area, providing a clean and purposeful solution to cover the children’s artwork. 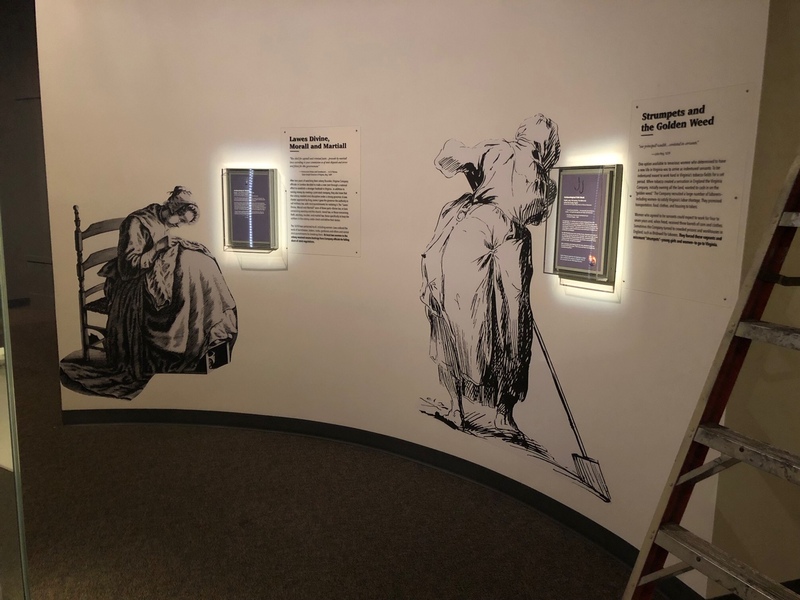 Finally, CMS provided labor to remove the old exhibit from the existing wall frames (carefully saving several vitrines, small cases and artifacts) and installed new exhibit panels. 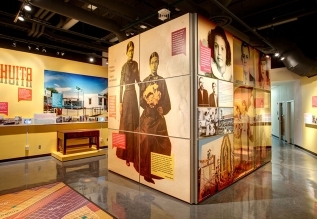 The existing exhibit structure used to display the panels looks like unfinished, wall framing, which is the look that the museum wanted to achieve. 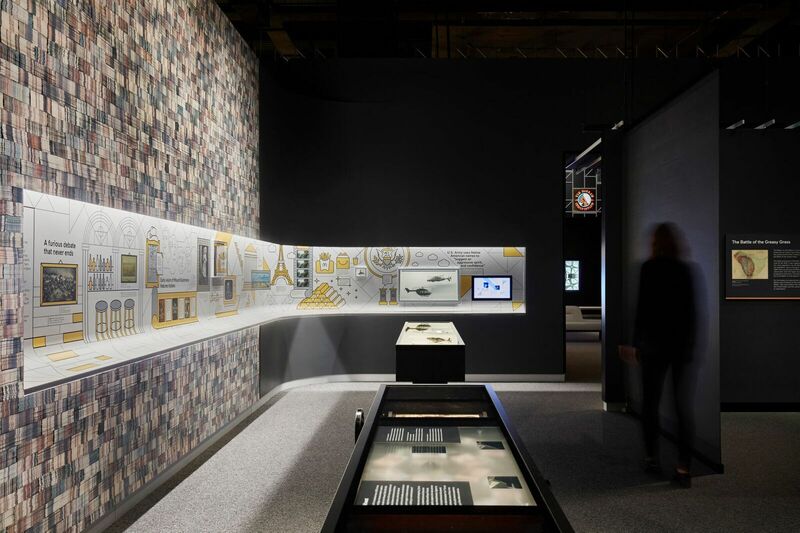 Nexus Grid Wall - a series of welded steel tubes to create a custom, metal, grid-work wall consisting of 26 flat wall-unit structures and 13 segmented ones, attached to custom built walls within the main gallery space. 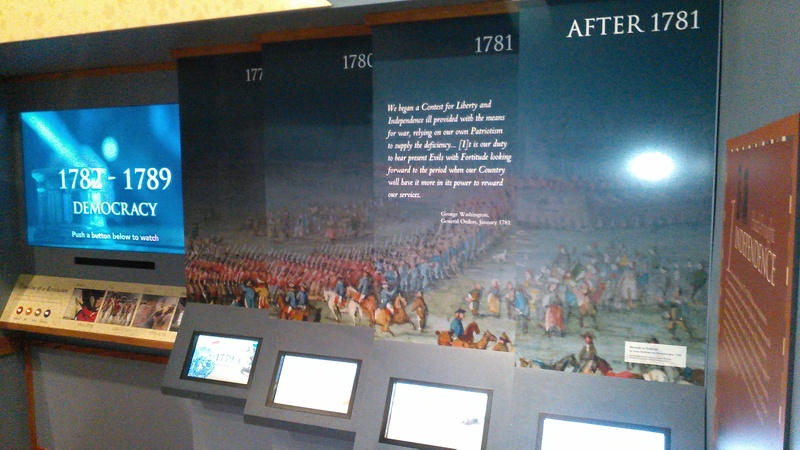 The final wall piece was powder-coated to receive graphic panels, display cases, backlit panels and projection panels. 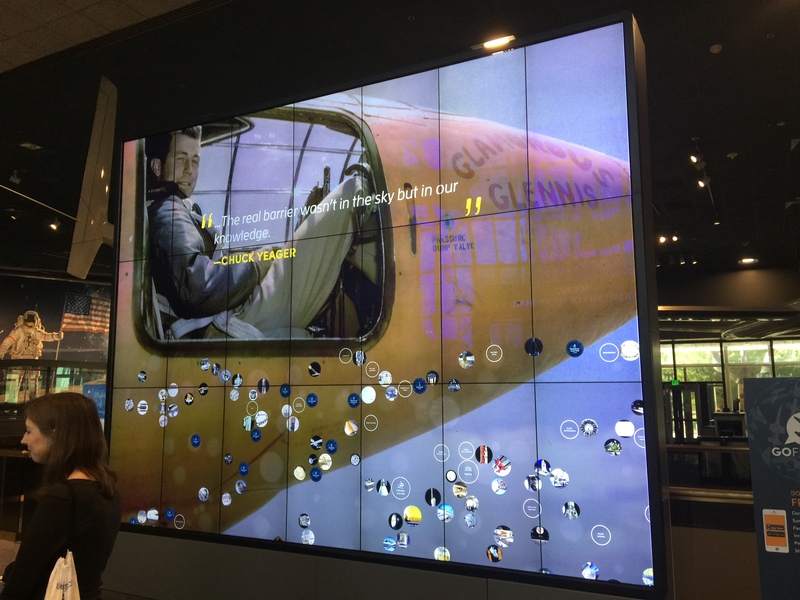 Nexus Projection Surface - 56 projection panels consisting of 1/8” thick aluminum in varying sizes with a special, projection-screen finish paint. 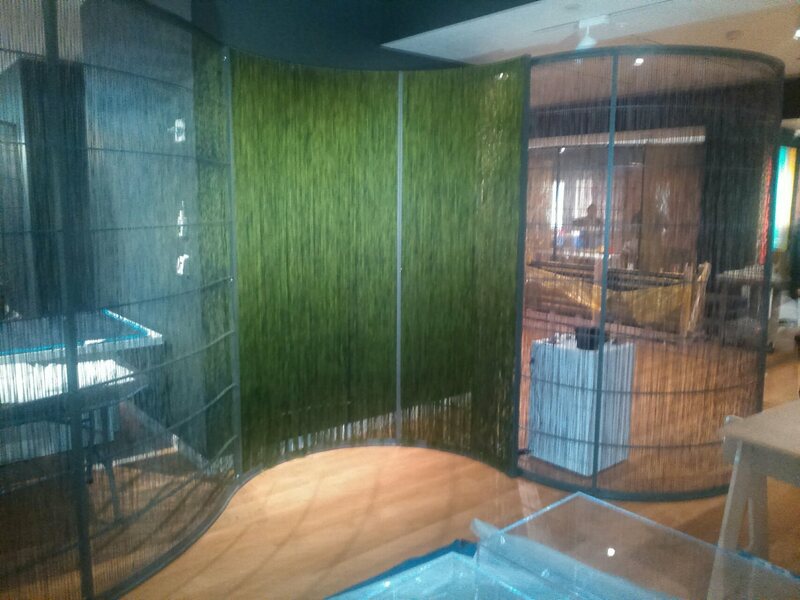 Nexus Motorcycle Case - Tube steel framing and Medite with a LUXAM LED lighting rod mounted across the front interior. 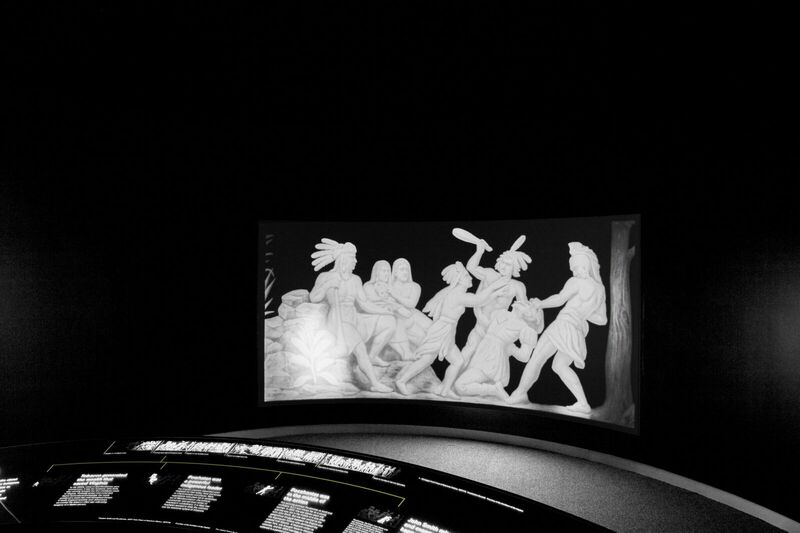 Pocahontas Frieze Display - A custom, one-of-a-kind element, CMS replicated a frieze (from the Capitol Rotunda) of Pocahontas saving John Smith from near death. 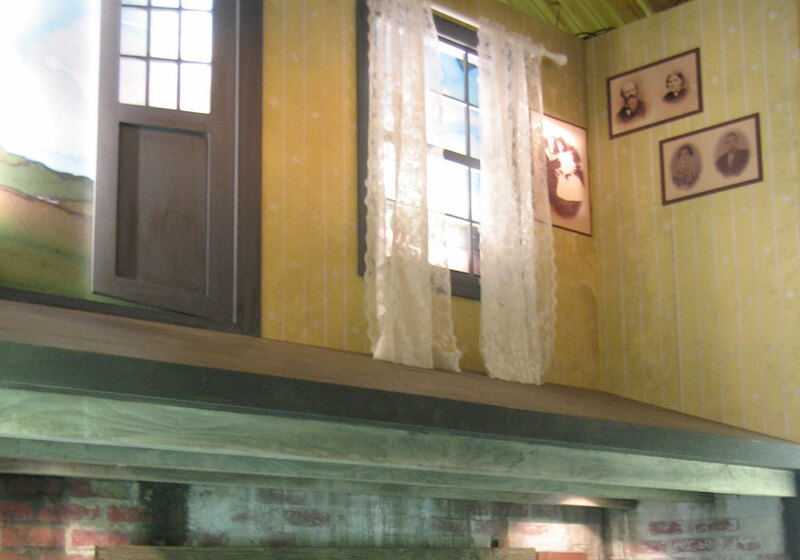 The feature wall frieze was carved out of Avonite. 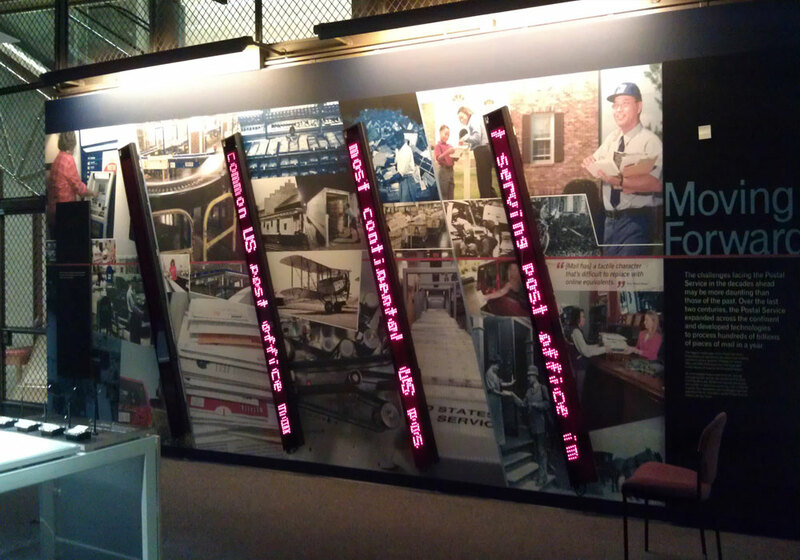 Sequenced lighting backlights the frieze creating a narrative for each piece referenced and an interpretive, curved, backlit table in front of the frieze contains the narrative outline, which depicts the story line by line. 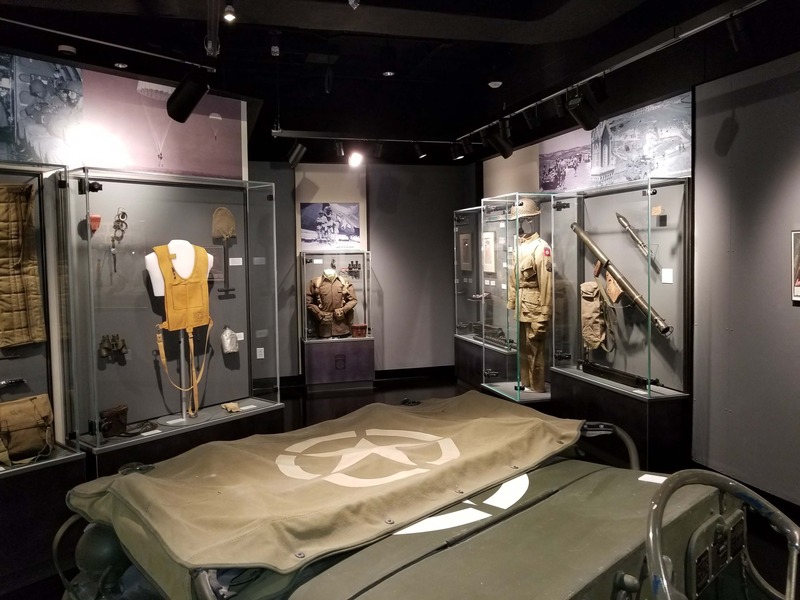 Projection Screen Curtains consist of 52- 3” square long, steel angles, mechanically fastened to the floor and positioned in a curved, staggered pattern. Removal Act Wall-Wall consists of Medite and acrylic with direct print graphics onto both front and back surfaces of lightbox acrylic. 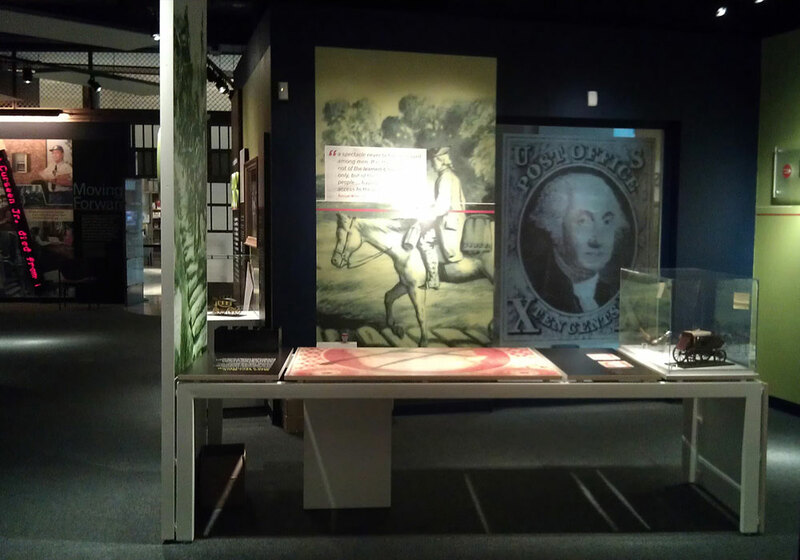 Intended to show the audience both the original text and the final text from the Act of Congress in 1830 for the removal of Indians to federal territory west of the Mississippi in exchange for their ancestral homelands. 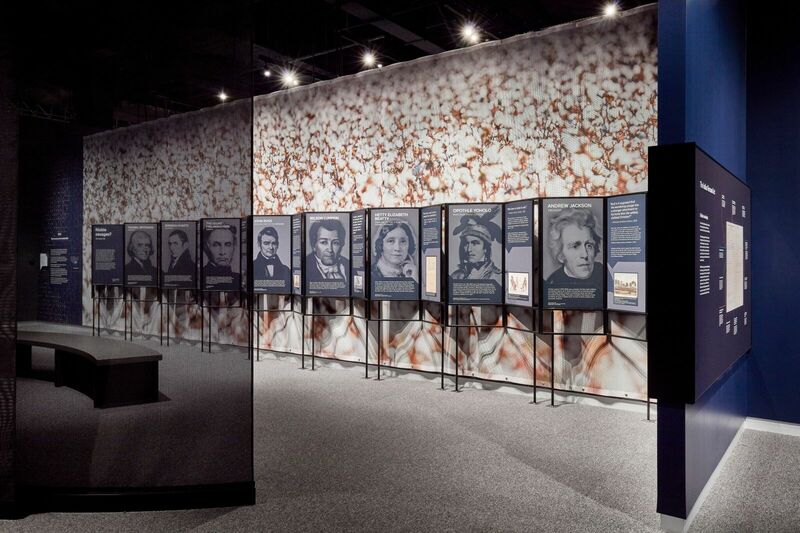 Debate Panel Wall-Custom, steel-angled frames, placed against a large, mesh-printed wall simulating a billowy cotton field depicting key people involved in the Indian Removal Act. 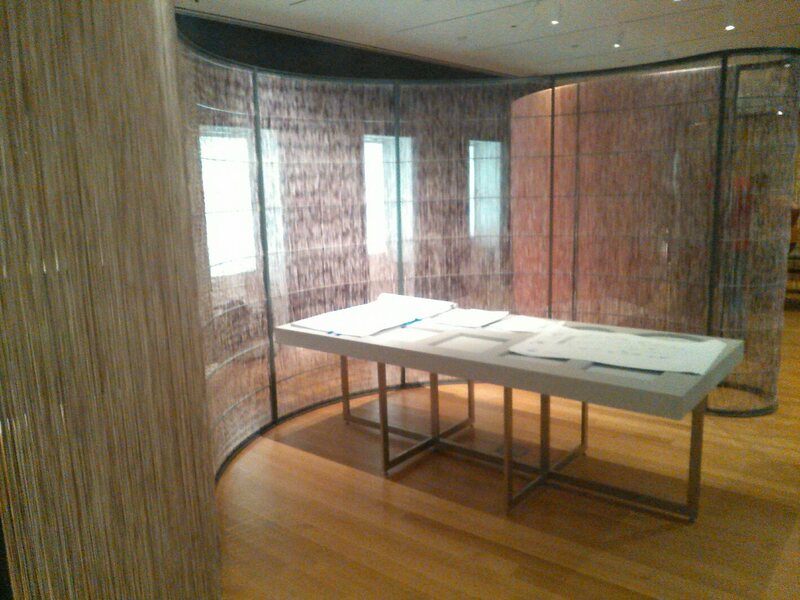 Custom Comment Table- a custom, irregularly shaped table, covered in Kaswell flooring with a curved edge and aluminum, powder-coated legs. 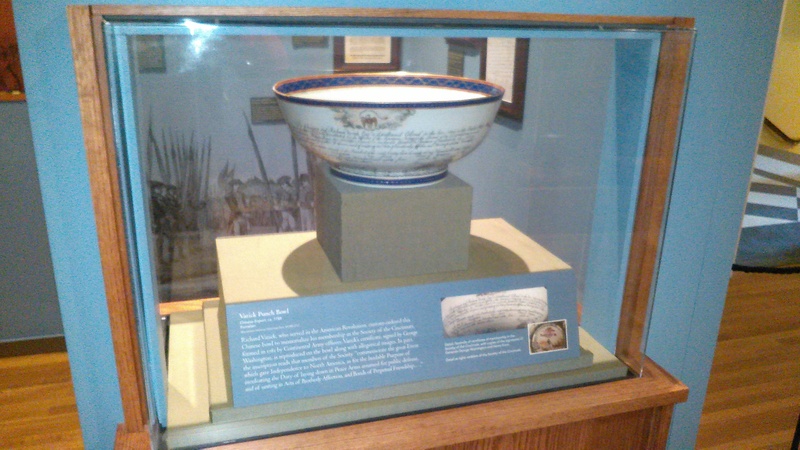 The table is used for comments and suggestions by visitors. 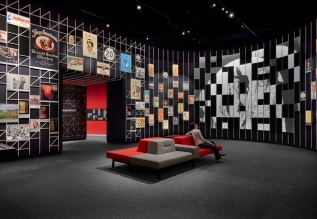 AV hardware Integration for 11 key media areas including: LBH Movie Reels projected onto 60 individual grid frames with two projectors; LBH Headdress Interactive; Ribbon-snake videos in Rooms 1,2 & 4; projection quotes on curved, hanging scrims in Room 4; Radio Broadcast Audio handsets; Remembering video; Pocahontas video; Nexxus Decoder multi-touch tables (which help visitors identify and learn more about the images, objects and displays located amongst the grids in the main gallery); and the Invention of Thanksgiving video which is a key feature in the exhibition. 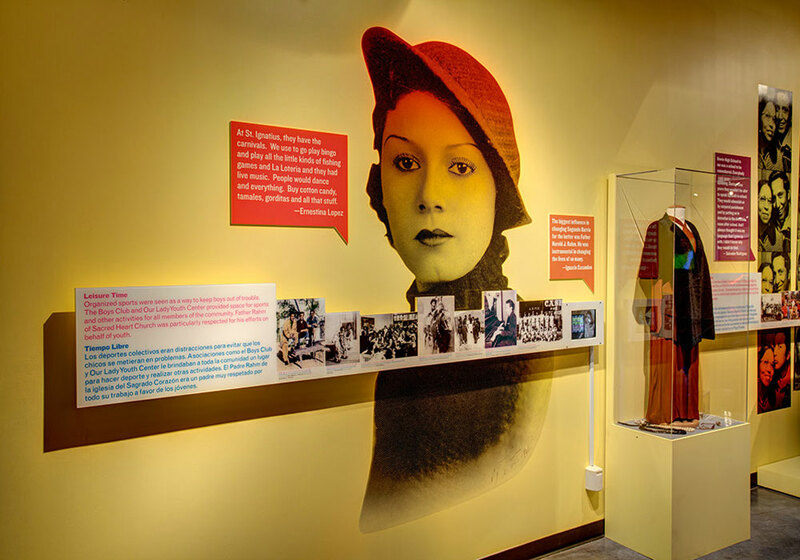 CMS partnered with Paris Design of Takoma Park, MD, to provide comprehensive exhibit design and fabrication services which included: space planning, content management, display-case design, graphic design, lighting design, detailing, fabrication, art production, A/V integration, delivery and installation services. 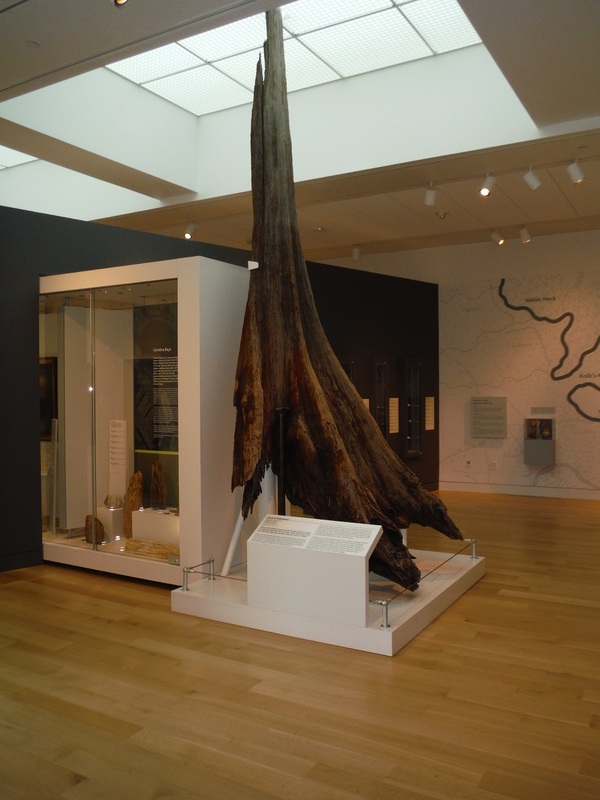 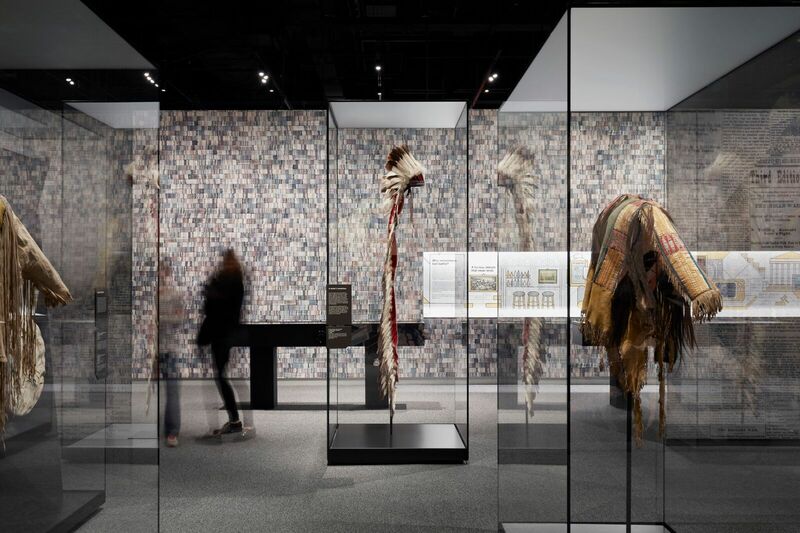 CMS was responsible for the design, fabrication and installation of over 240 artifacts and artifact mounts as well as A/V integration in the exhibit space. 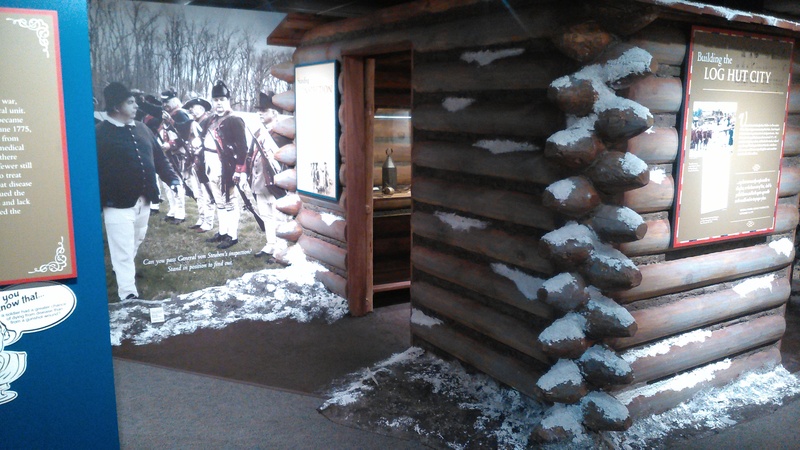 Visitors step into history to see Fort Ligonier and how it came to be. 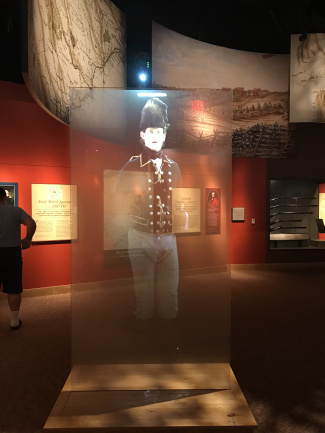 From the start, visitors travel back in time with a “Reverse Timeline” to the period when the Fort was a living, thriving community. 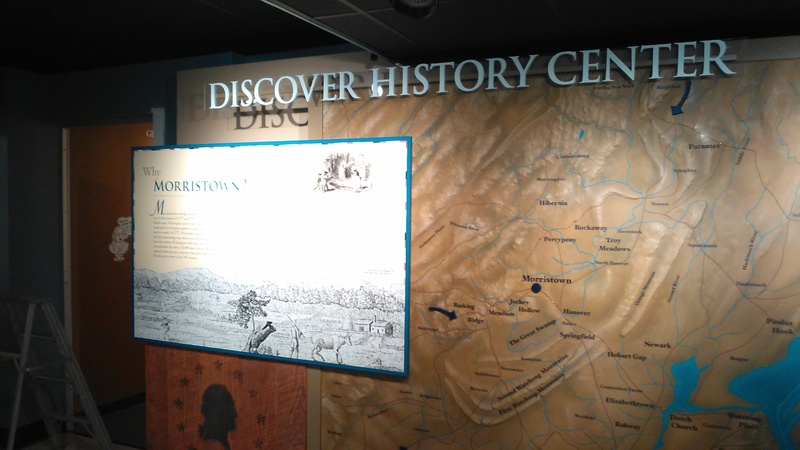 They continue on to Forbes Road, to learn about the British Troops of the 1758 Forbes Campaign, who built a road and multiple fortresses across Pennsylvania. 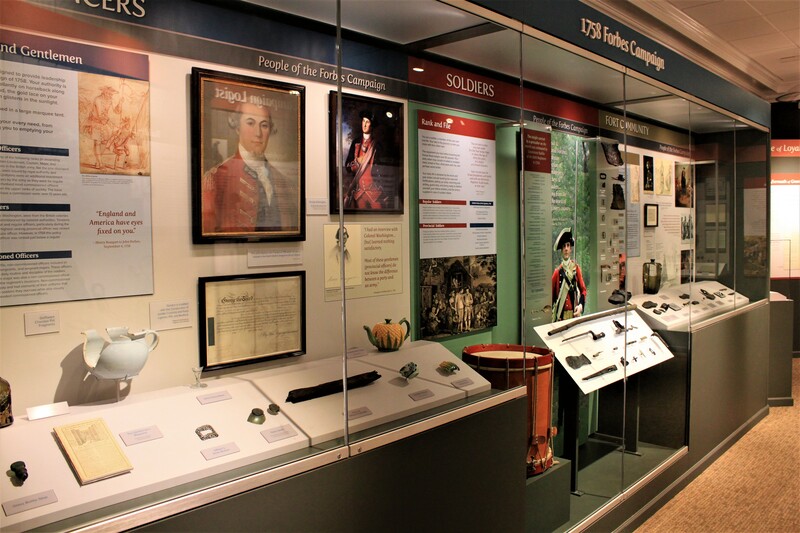 In the History Gallery, visitors can see what 18th century life was like at the Fort and view hundreds of artifacts illustrating the diverse community behind its walls. 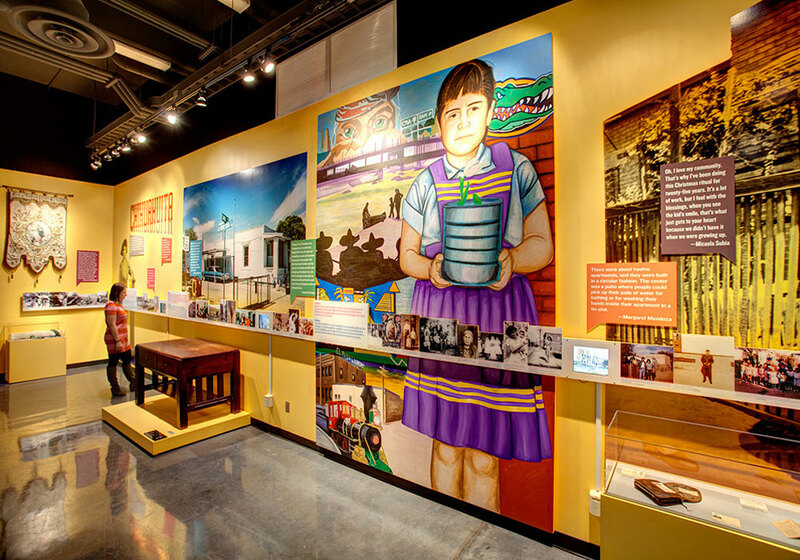 An additional children’s area allows for hands-on dress up and learning. 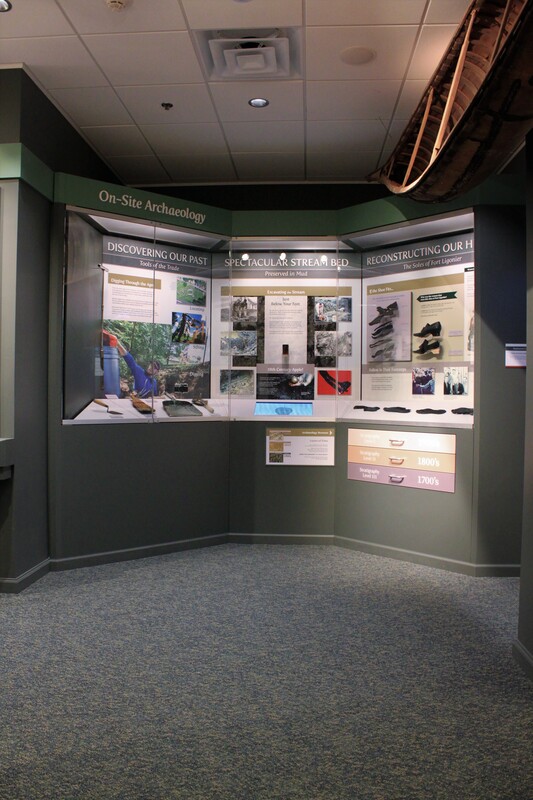 The Archaeology and Reconstruction Gallery illustrates the extensive excavation conducted on site and displays many of the unique and fascinating finds. 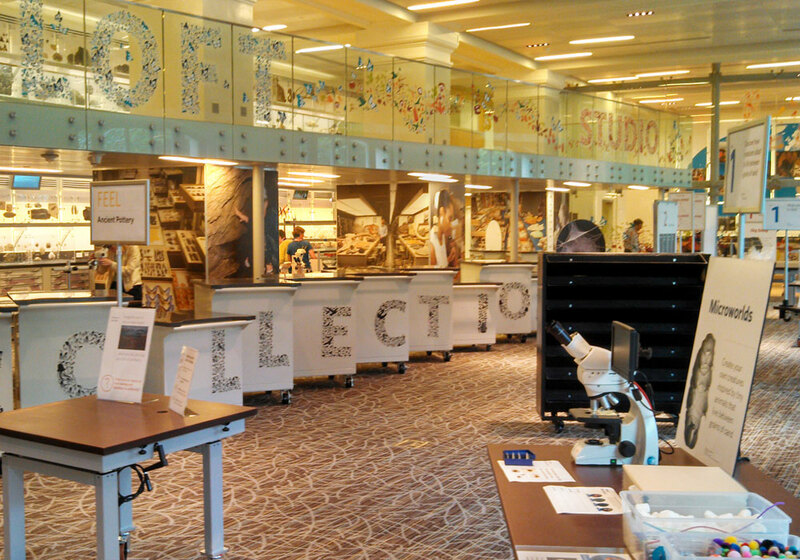 Thousands of artifacts were unearthed, cataloged and are stored in the research library. 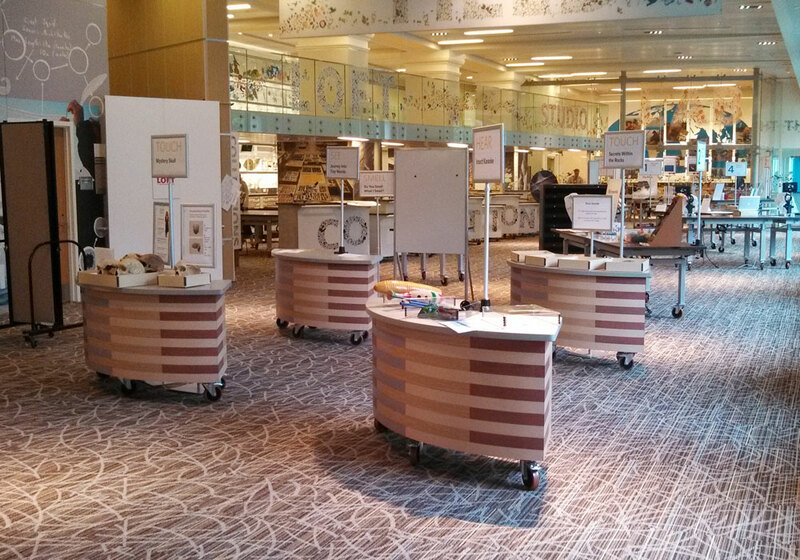 There are over 240 specially selected items. 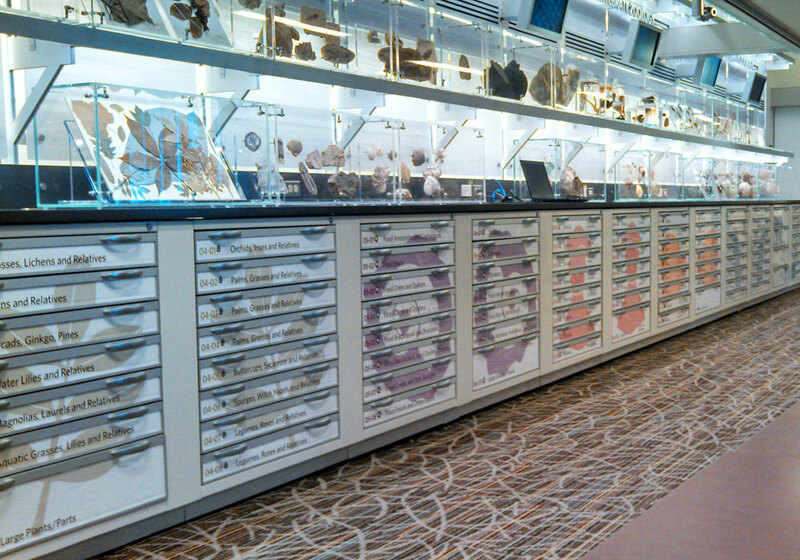 Each one was carefully recovered, cleaned, measured and prepared for display using the highest-quality museum techniques and standards. 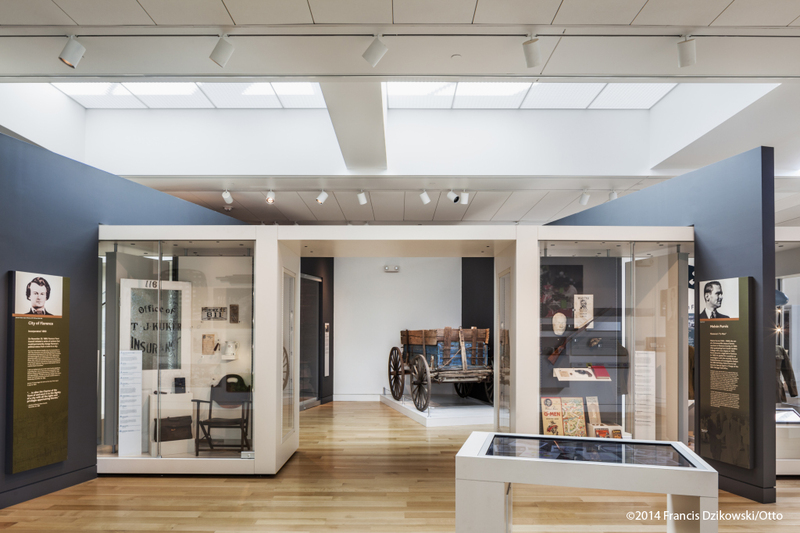 Throughout the renovation, custom case interior lighting and exhibit track lighting were carefully selected and installed to bring the historical collection and custom-produced graphic story to life. 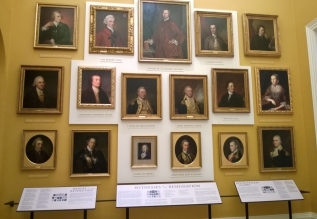 In the Washington Gallery, one can see the priceless “Washington Pistols” gifted to George Washington from his dear friend the Marque de Lafayette. 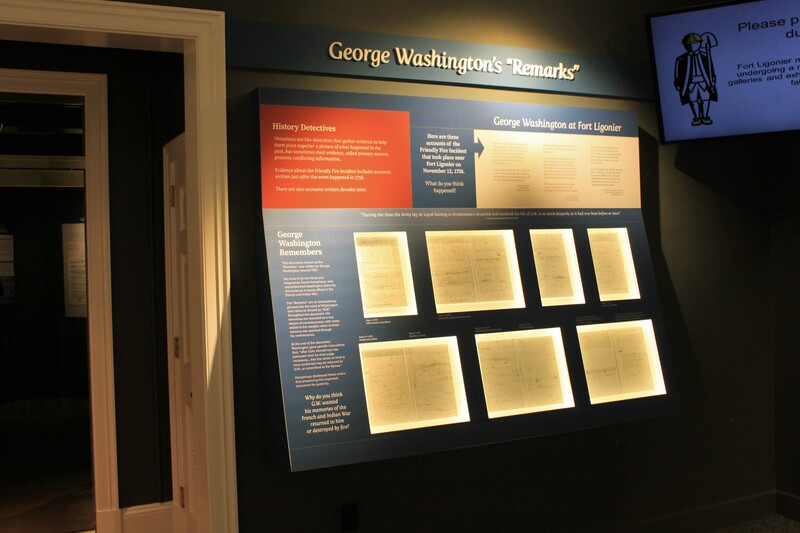 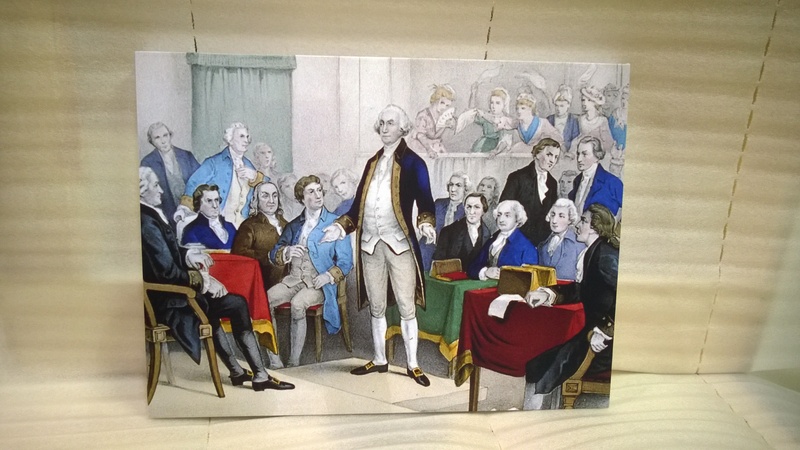 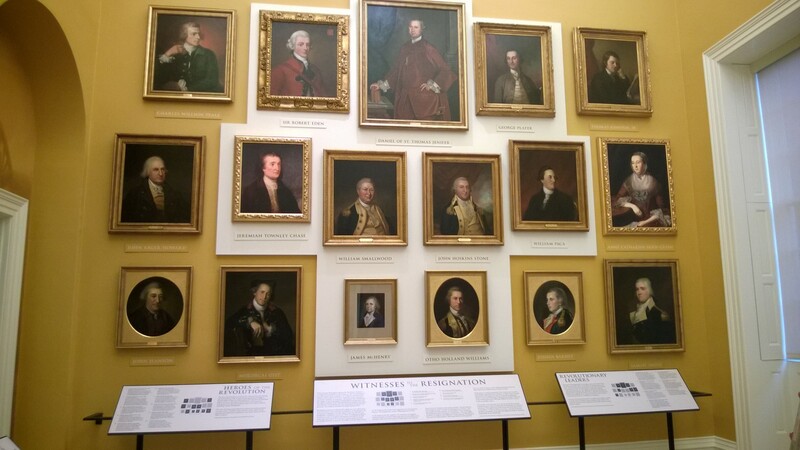 Also, creatively displayed, are facsimiles of Washington’s original papers, ready for the visitors inspection (the original set resides in the research library.) 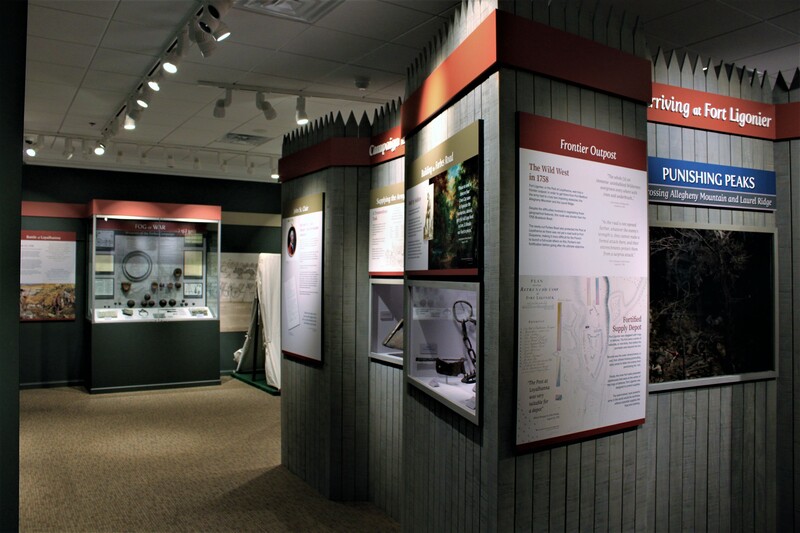 Lastly, don’t miss the opportunity to walk the reconstructed Fort, located just outside the museum galleries. 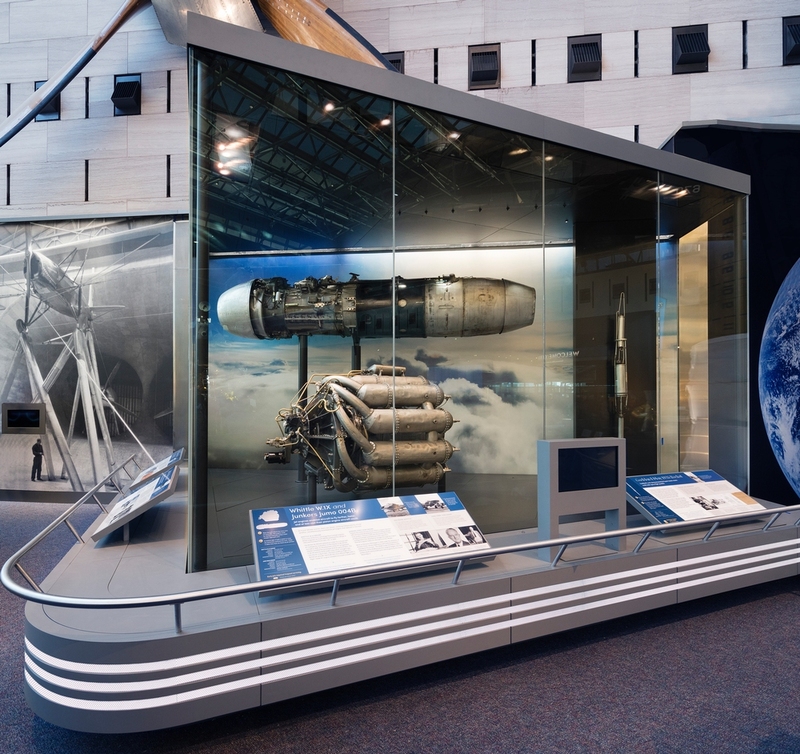 CMS provided final detailing, value engineering, fabrication and installation for the 25,000 sq. 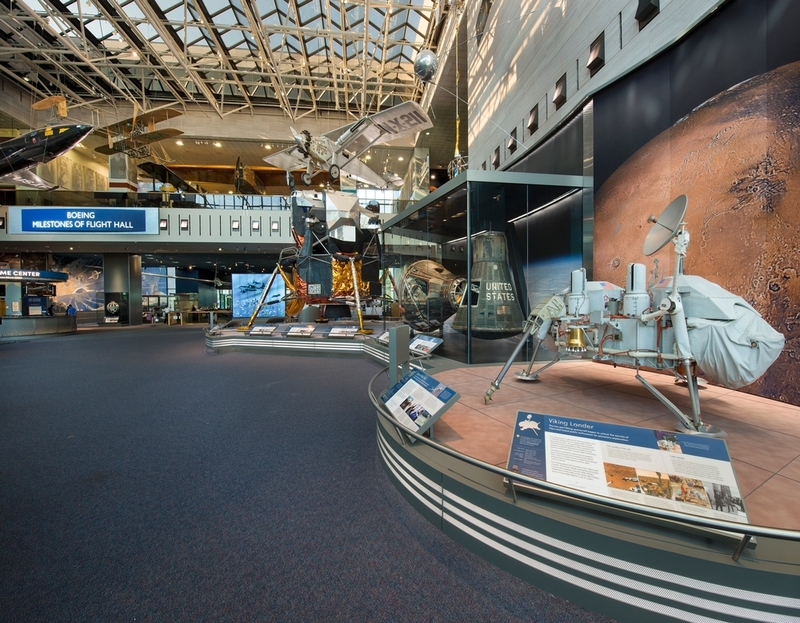 ft. renovation of Galleries 100 and 108 of the Smithsonian's National Air and Space Museum, which included a new Welcome desk, exhibit structures, steel platforms and steel and glass display cases. Gallery 100 consisted of two large display cases housing (5) iconic objects mounted on custom, steel structures with integrated platforms. 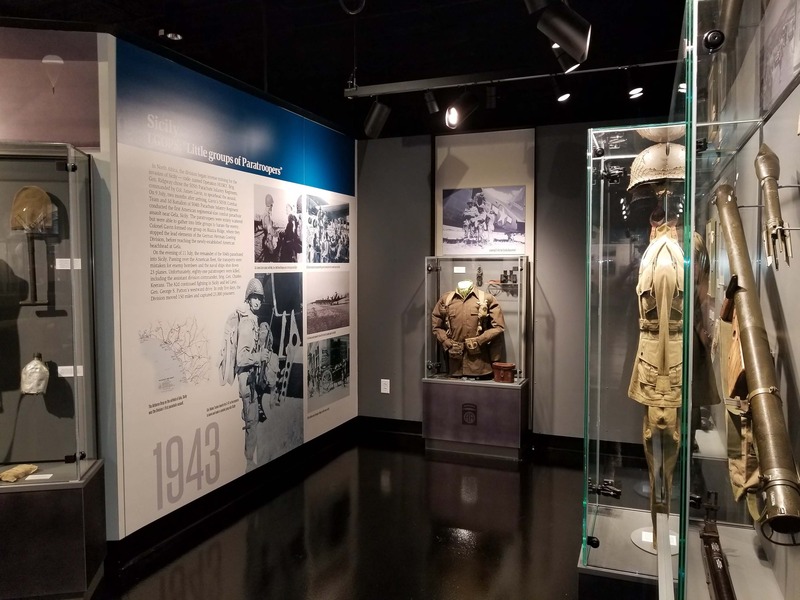 Their fabrication and installation required close coordination with various subcontractors including structural steel specialists, electricians, mechanical security specialists and drywall and glazing installers. 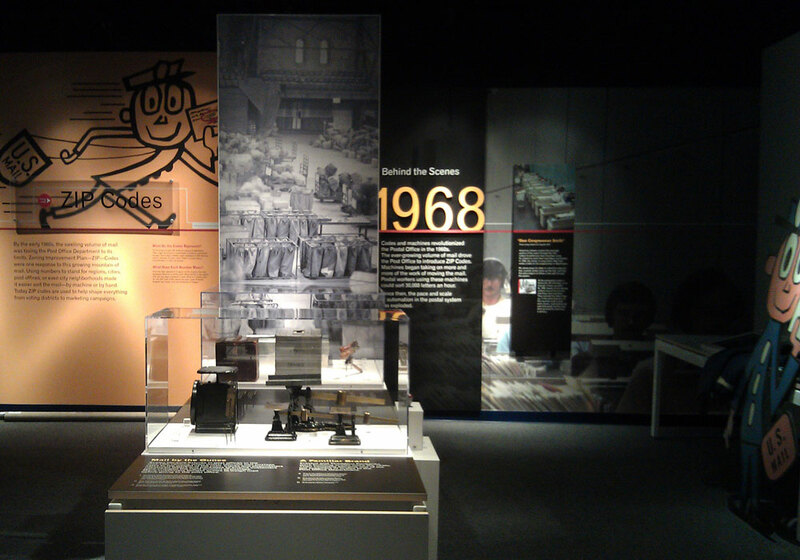 Over (70) unique platform sections were assembled in a specific sequence, leveled and fit into place. 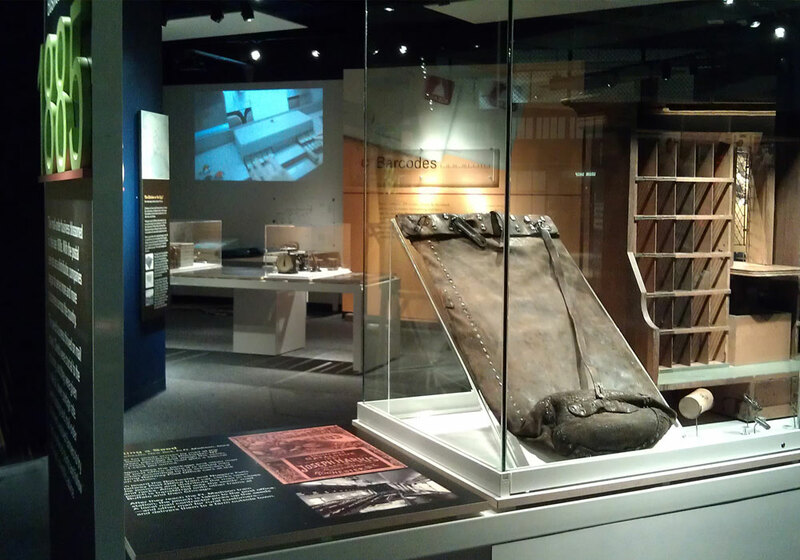 Back base frames were set allowing macro-artifacts with custom floor rolling brackets to be moved into position. 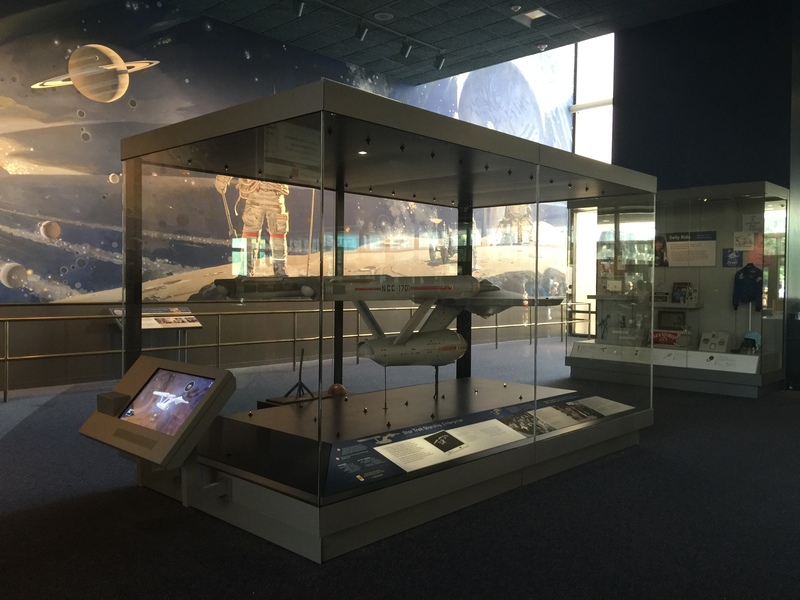 A powder-coated, 1/4” aluminum, tiled floor was installed over a 3/4” Medite, vapor barrier. 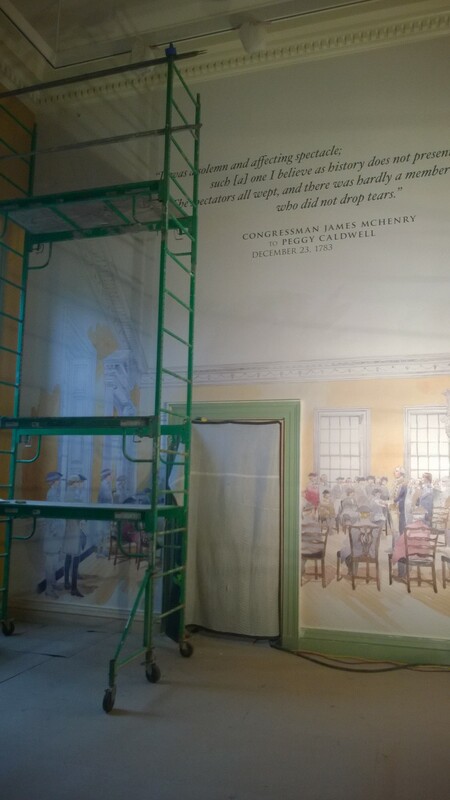 After the case glass was set, (with much skill and precision), the two side platforms could be installed, again requiring special installation sequencing. 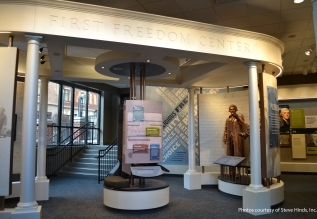 All of the fabrication and install work was executed with the utmost care in this highly visited, historical building, in downtown, Annapolis, Maryland. 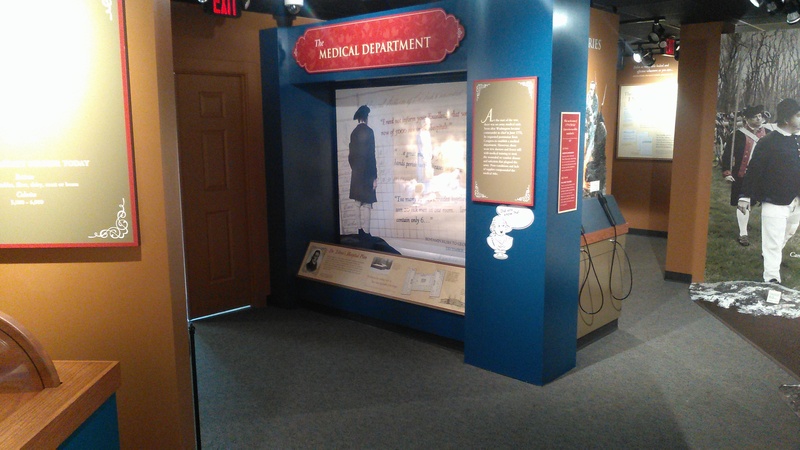 CMS was not allowed to drill or mount the numerous reproduction prints and large monitors directly to the walls. 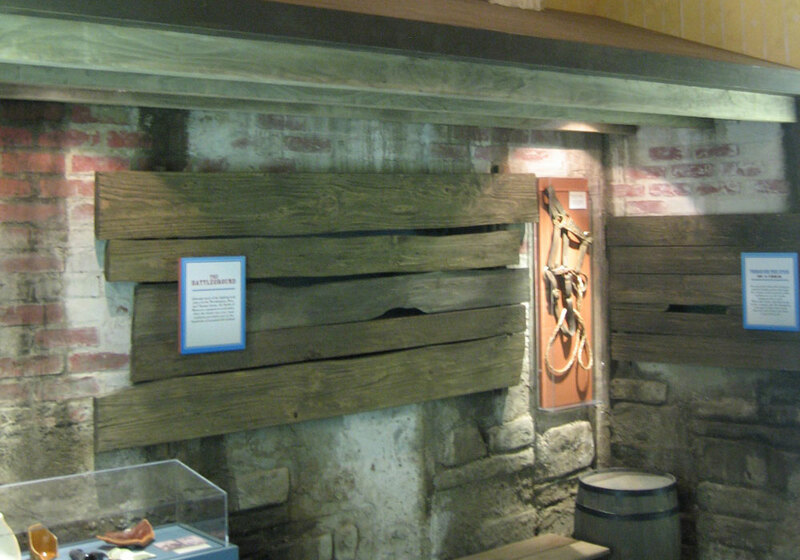 Custom mounting brackets were conceptualized and fabricated by CMS to distribute the weight evenly across mortar joints. 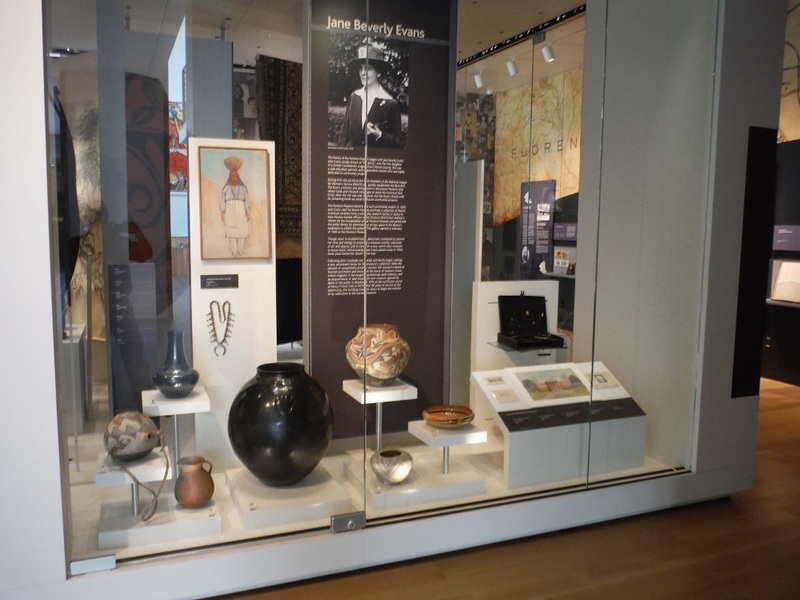 Artifacts were also of high, intrinsic value and importance. 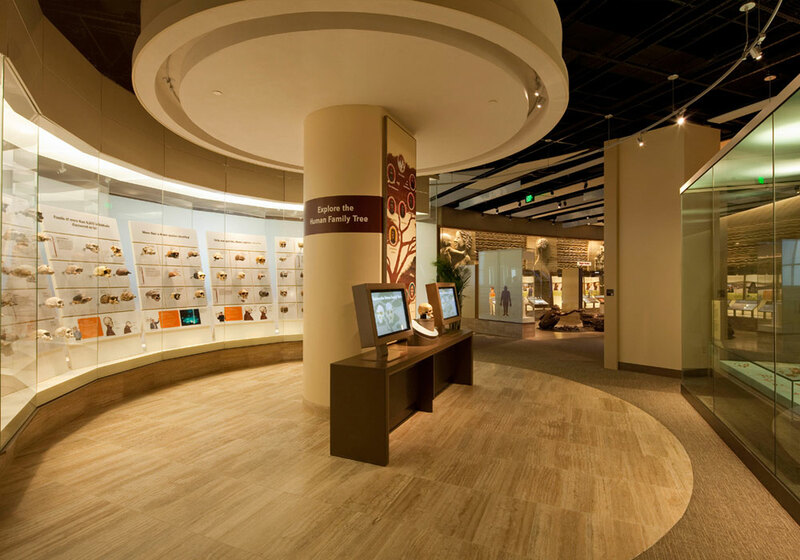 Our experienced mount-makers were able to skillfully tackle all required tasks and achieve successful satisfaction from the client and designer. 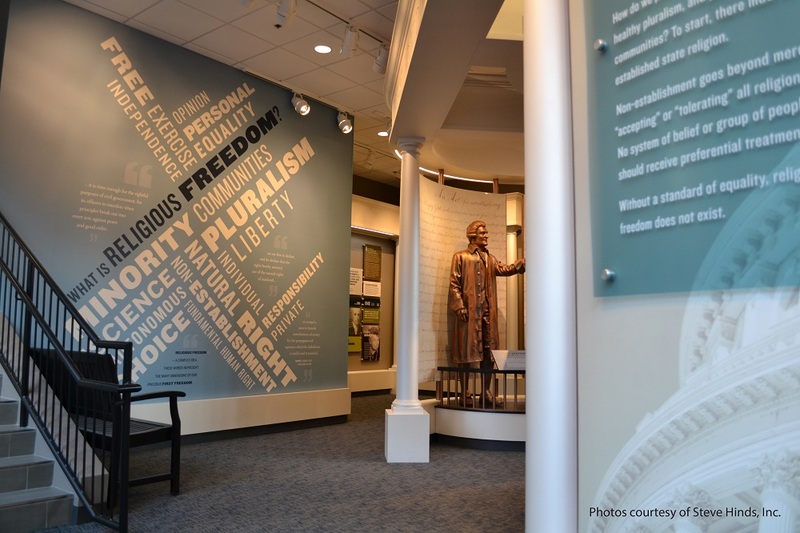 The Valentine First Freedom Center houses 2,200 square feet of exhibits that delve into America’s experience of religious liberty from its European antecedents through today. 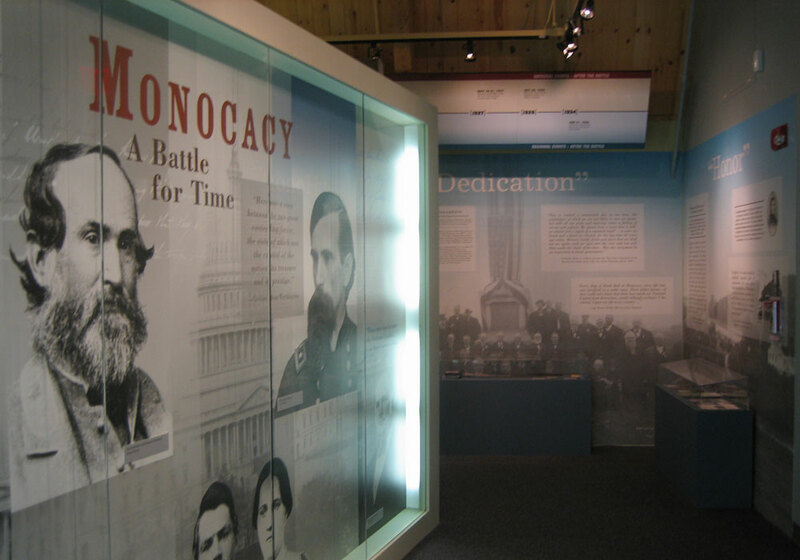 Updatable modules allow flexibility to highlight historical as well as contemporary events. 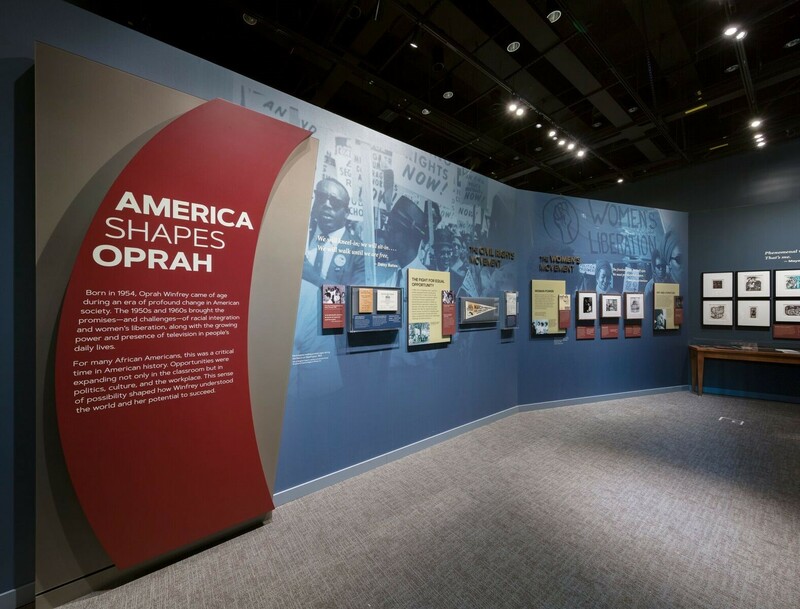 CMS provided final detailing fabrication, finishing and installation of all exhibitry designed by The Design Minds. The centerpiece of the exhibit is a large oval shaped central display called the Four Pillars of Freedom, and features statues of Jefferson and Madison, a custom upholstered seat cushion, touch screen A/V integration, lighting, and document graphics commemorating the United Nations’ Universal Declaration of Human Rights. 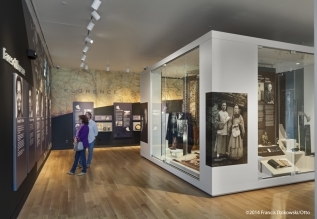 The mission of the Florence County Museum is to provide a dynamic sanctuary for the preservation, interpretation and exhibition of objects of scientific, historic, and artistic significance that are unique or of special interest to the people of Florence County and the Pee Dee region of South Carolina. 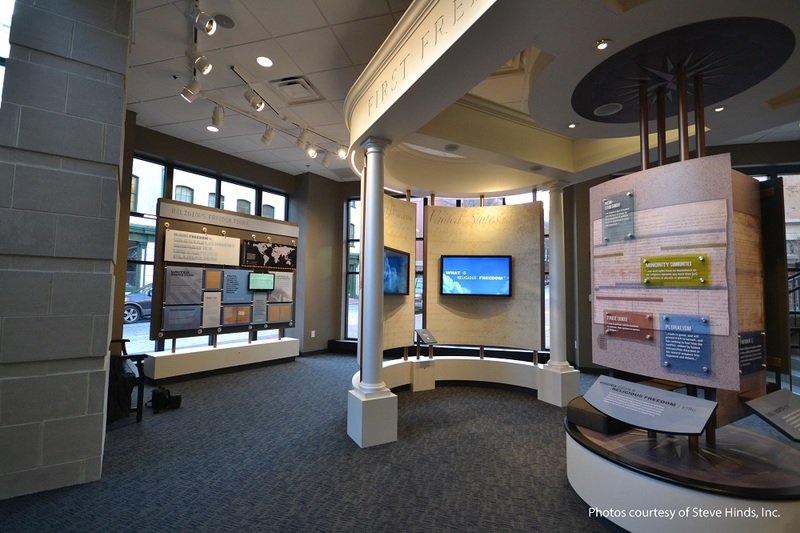 CMS was awarded this project through competitive bid after designer Haley Sharpe recommended that we be included on the private bidder list. 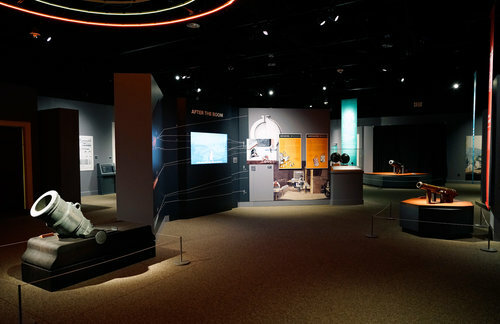 The exhibition is displayed in multiple galleries on two stories of this custom facility. Components on the first floor 3,300 square foot gallery include an 11 foot high, 24 foot by 24 foot display case that can be viewed from four sides. 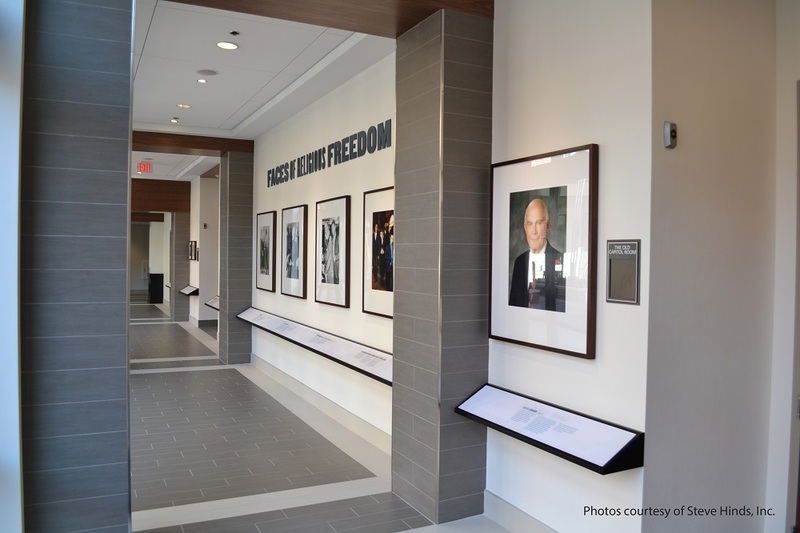 The CMS scope of work included the detailing, fabrication and installation of the case – including fiber optic lighting installation throughout the ceiling and custom double locking glass doors. 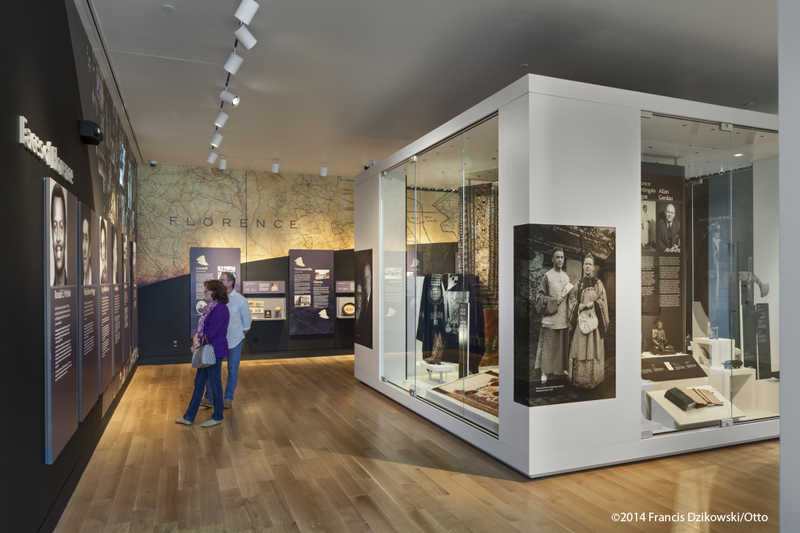 One column of the case houses a projector for an evolving display about the people of Florence. 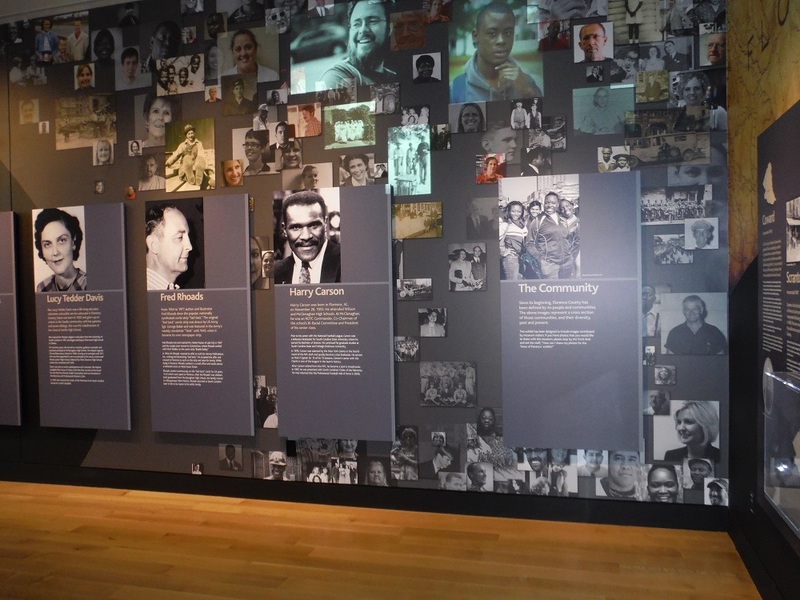 The exhibit has the ability to be updated with photos of people who want to add their face to the existing show. 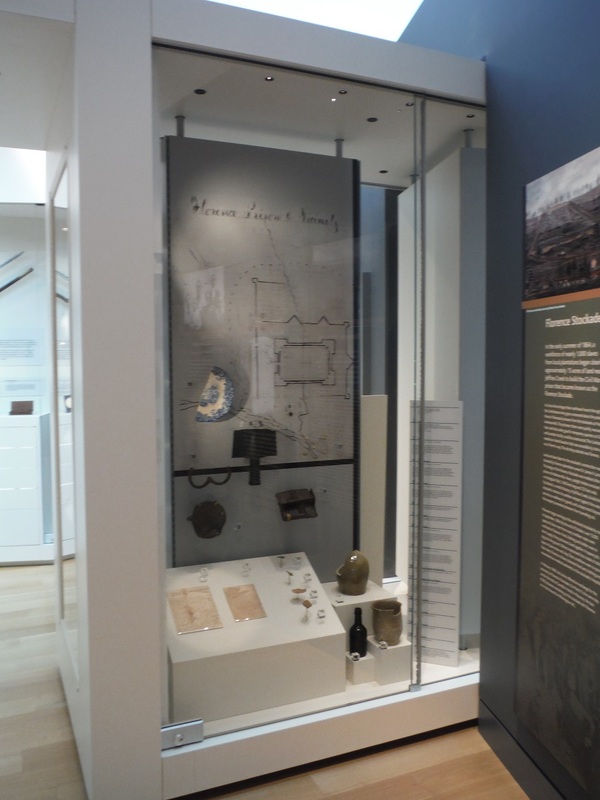 Each side of the display is an independent collection from the others, allowing for easy changing of artifacts and subjects. 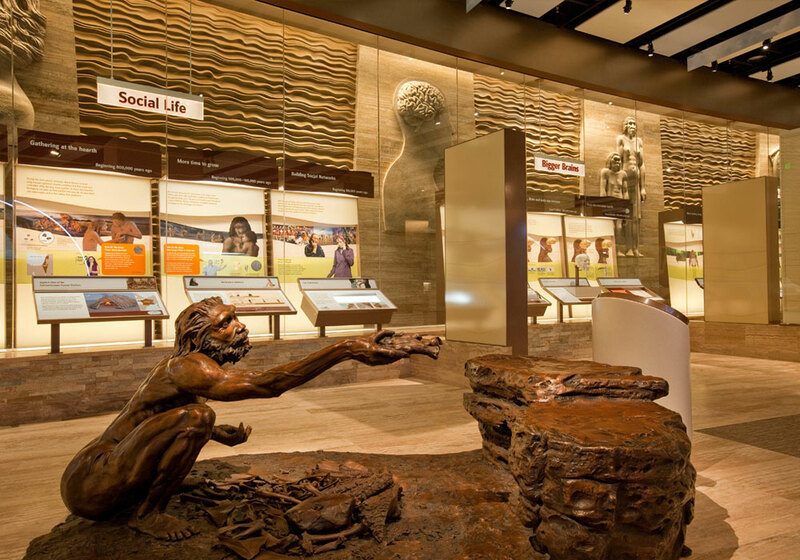 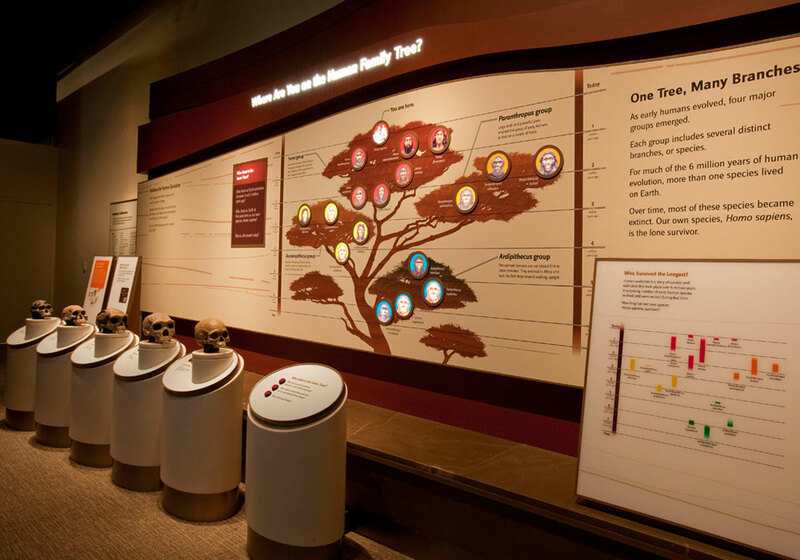 Smithsonian National Museum of Natural History “David H. Koch Hall of Human Origins” is Smithsonian’s centerpiece exhibition on human evolution and the Human story. 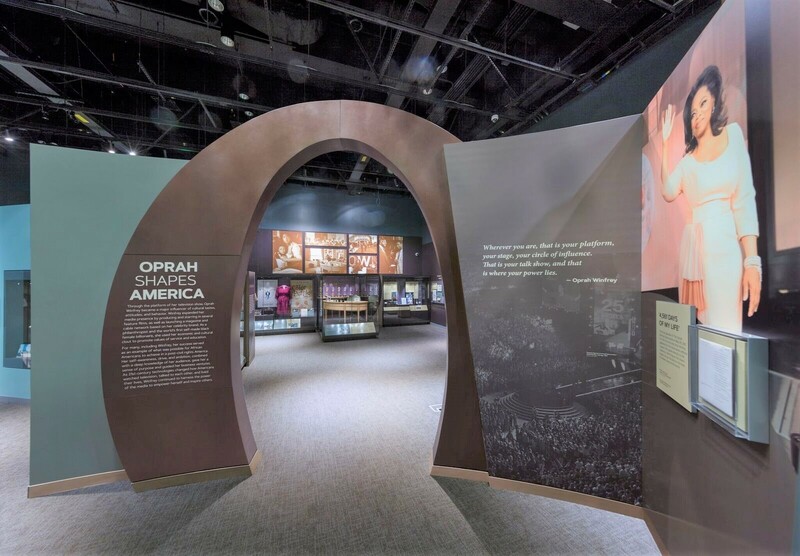 CMS was chosen to detail, fabricate, deliver and install this major exhibition the largest exhibition CMS has produced to date. 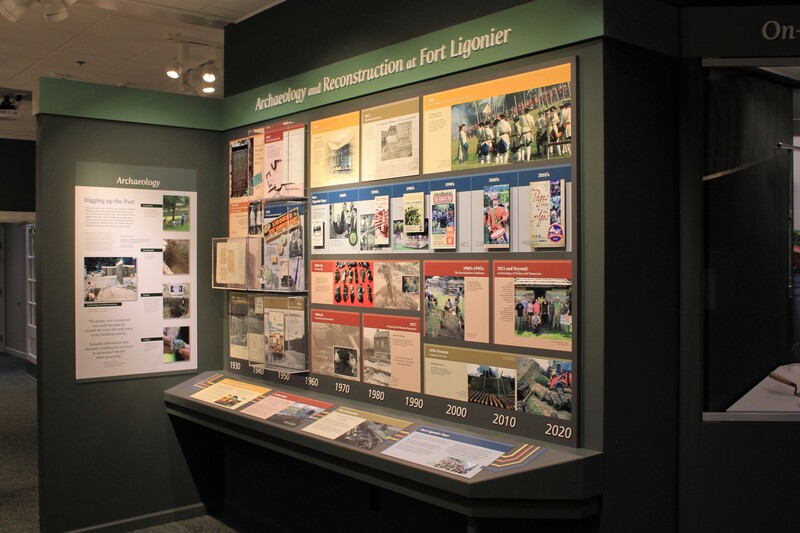 In addition to our own in-shop work, the scope included managing major subcontractors including; the general contractor, illustrators, scenic designers and installers, wallpaper specialists, glass suppliers and installers, a glass case fabricator (in Belgium), and artifact mount makers and installers. 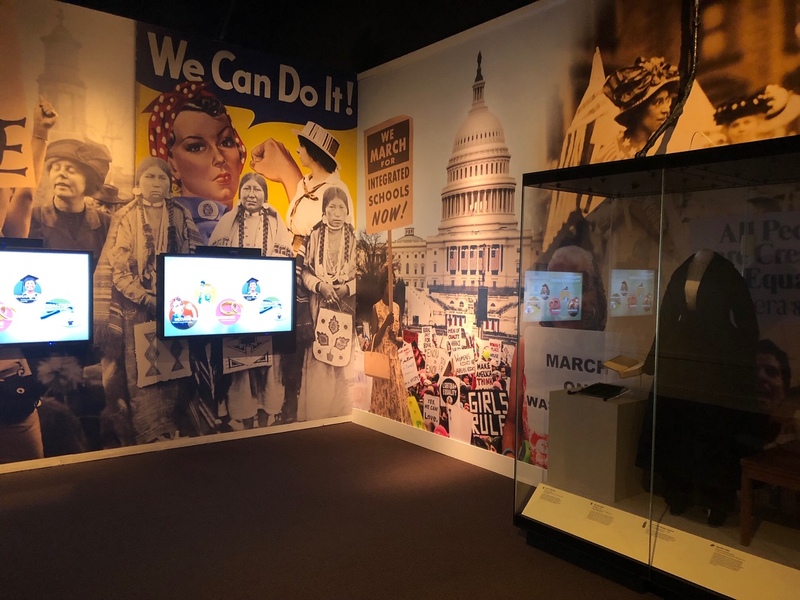 CMS also provided art direction services and interface with a forensic sculptor, casting foundry, A/V systems integrator, and Smithsonian Office of Exhibit Central who was responsible for the Lucy diorama. 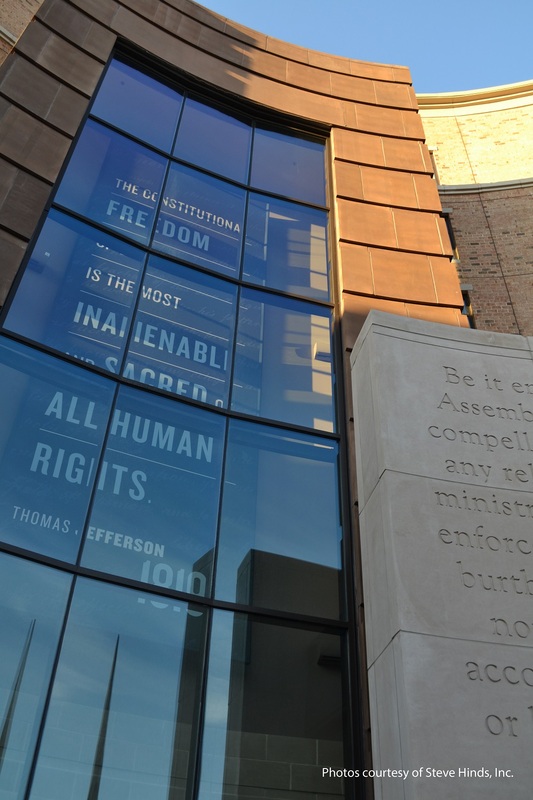 This fourteen month, seven million dollar project is the centerpiece of CMS’ portfolio of success with budget and timeframe restraints all being met. 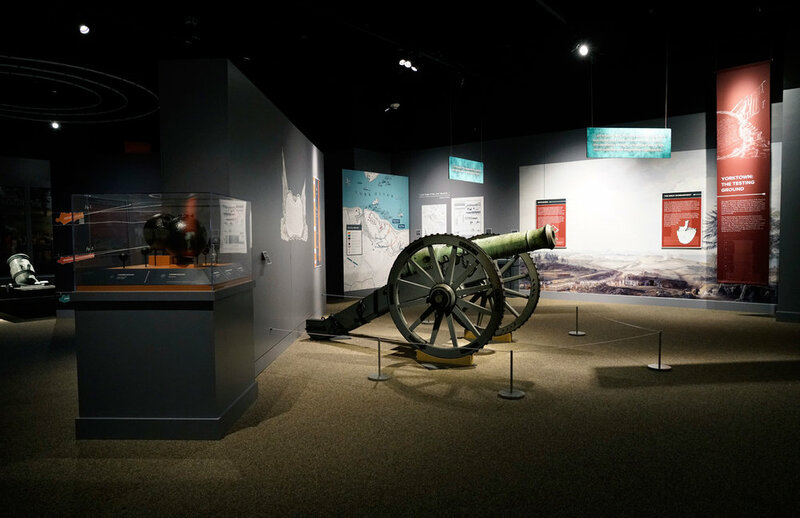 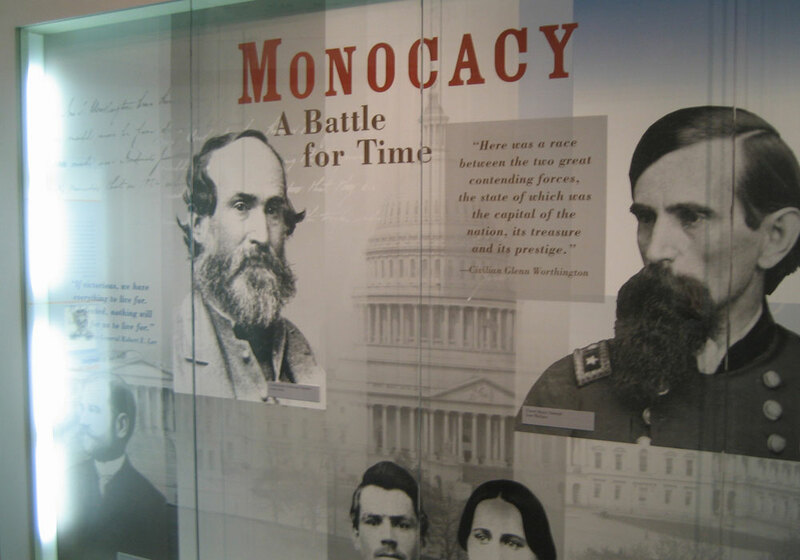 National Park Service “Battle for Time” at Monocacy National Battlefield in Frederick Maryland features over 6 vignettes illustrating the U.S. Civil Wars littlest known battle, The Battle of Monocacy. 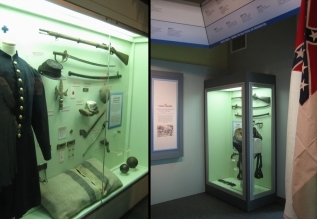 The visitor can immerse themselves in sight and sound experiences like General Jubal Early’s field tent with his original field desk, to the cellar of a farm house where one can see and hear the sounds of the battle outside the boarded-up cellar windows, Listen to soldiers retreat over a burning railroad trestle, or hear soldiers personal observations of the battle and the difficulties of war. 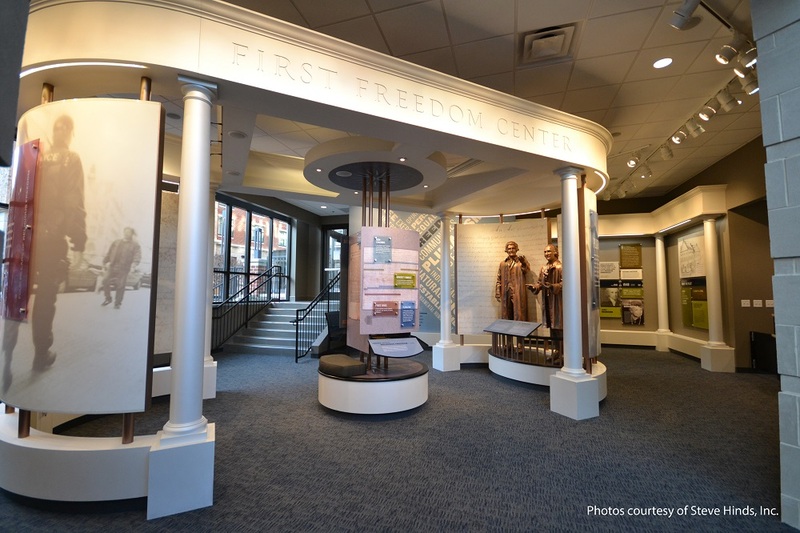 CMS provided final detailing, value engineering, fabrication and finishing, delivery and installation labor for this beautiful and informative visitor center in the Historic Frederick MD. 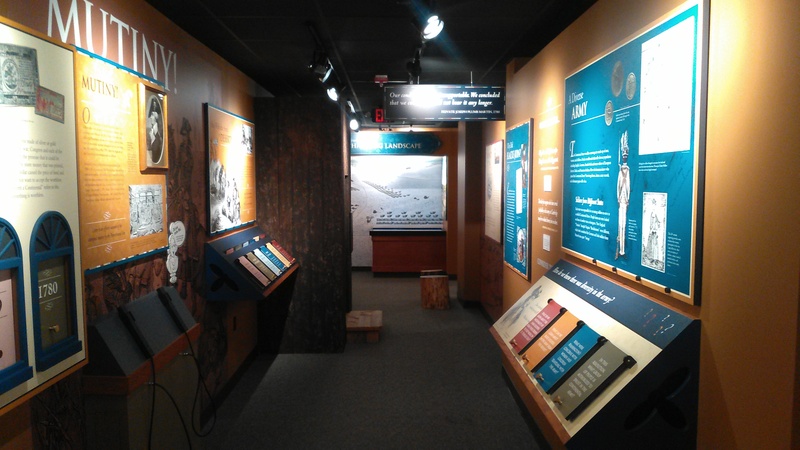 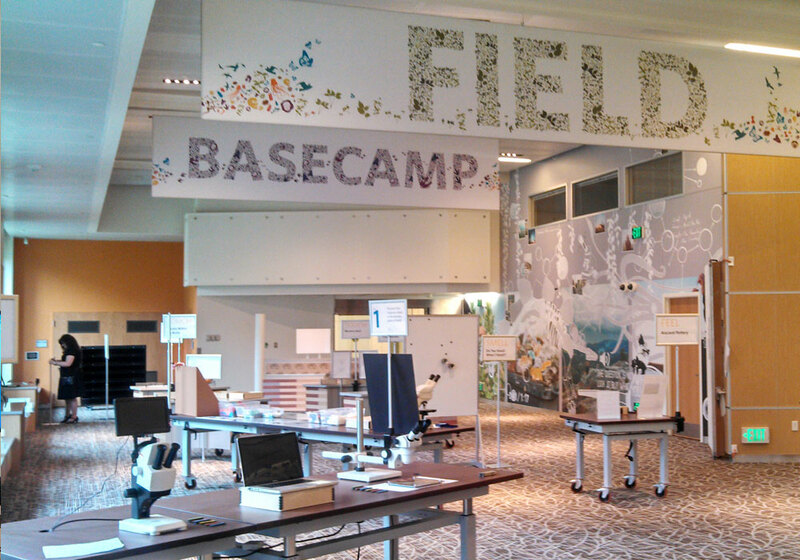 The exhibits occupy 2,200 square feet of space in the newly constructed visitor center at the park. 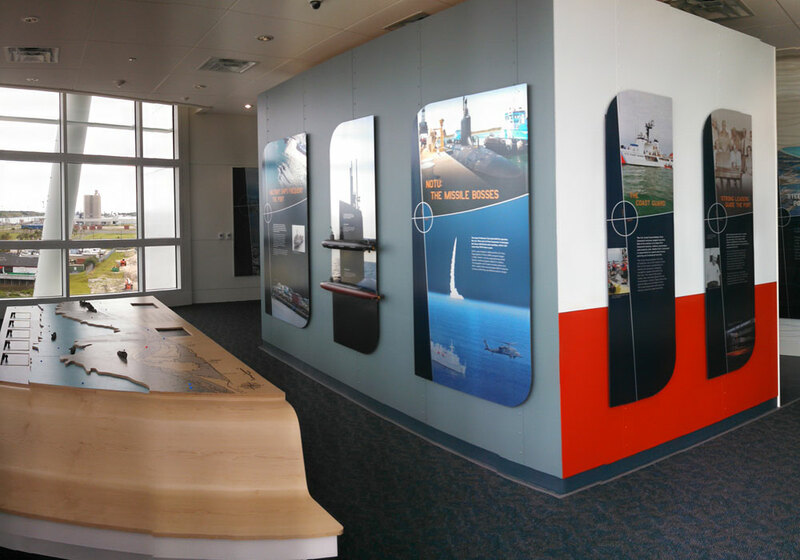 Canaveral Port Authority “Cove Welcome Center” is the centerpiece of an extensive redevelopment of The Cove harbor-side dining and retail area, as well as a community hub, repository of local history, visitor magnet and gateway to the region's attractions. 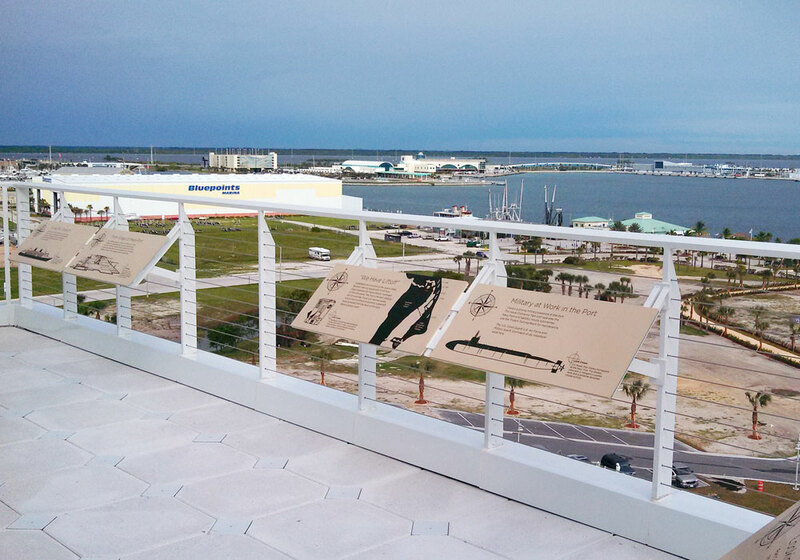 CMS, working in close collaboration with the designer, provided detailing, fabrication and installation of a new Welcome Center featuring an iconic, seven story structure overlooking the Cape Canaveral Bay in Florida. 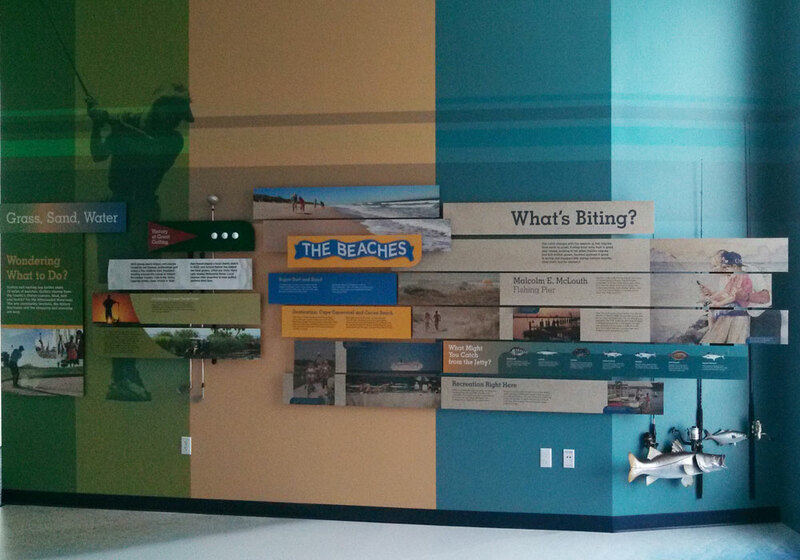 The new Cove Welcome Center features exciting exhibitry on all seven levels. 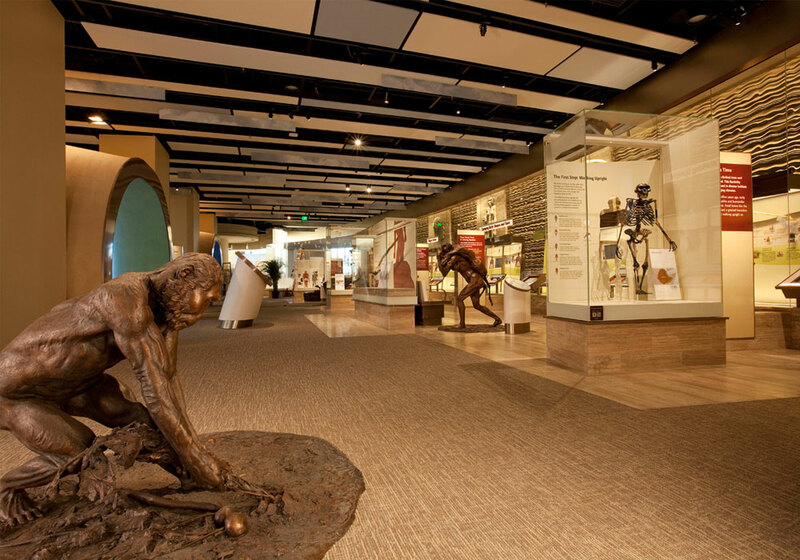 SI-National Museum of Natural History “Q?RIUS” will function as a physical education center at NMNH, and as an open collaborative laboratory for the study and investigation of learning natural history science. 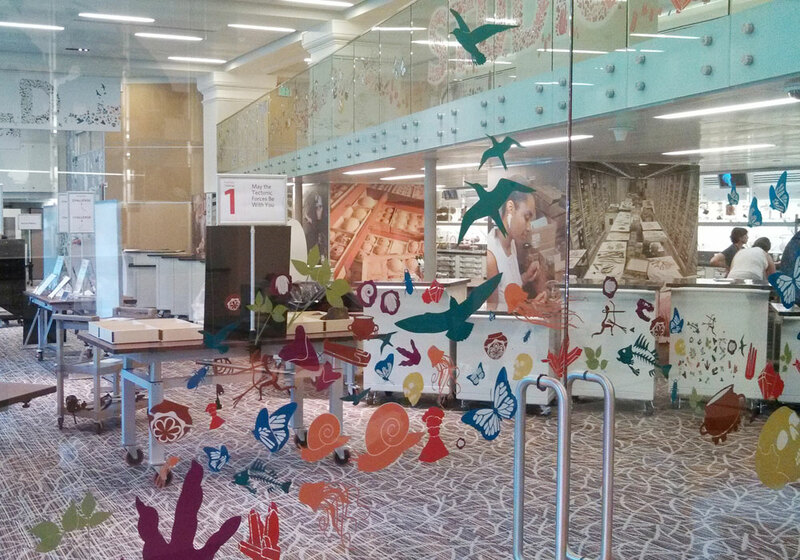 After a competitive bid process on our open IDIQ contract, CMS was chosen to detail, fabricate, deliver and install permanent hands-on education space. 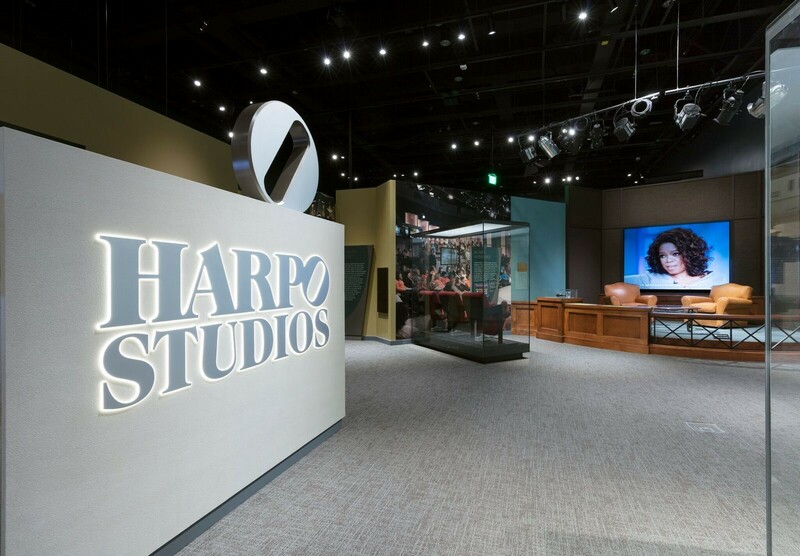 Out of the 12,800 square ft, approximately ten thousand square feet (10,000 sq. 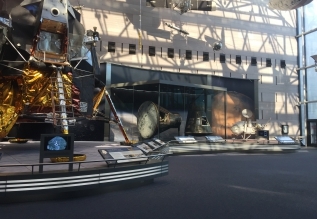 ft.) space will be used for public activities, and the remainder of the space will be allocated for offices and support space. 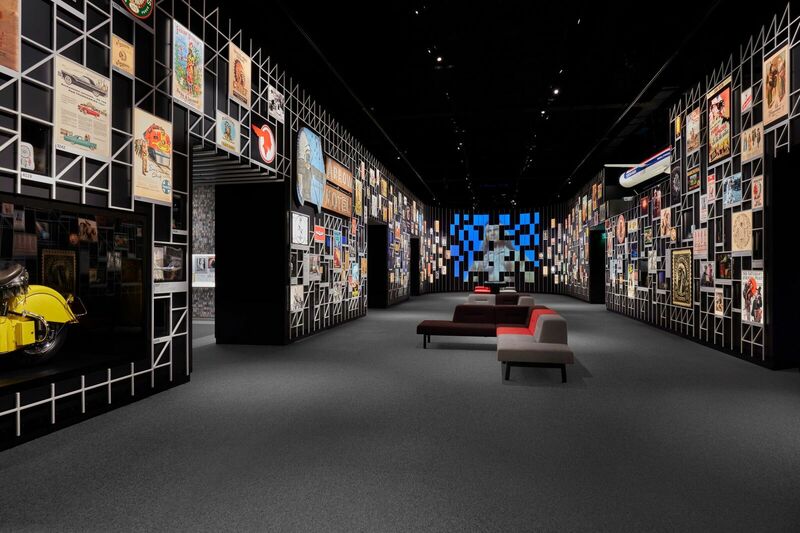 The space includes an entry way mural, signs, custom furniture, off-the-shelf products, collection display walls, media interactive, built-in collection cabinets, and videos. 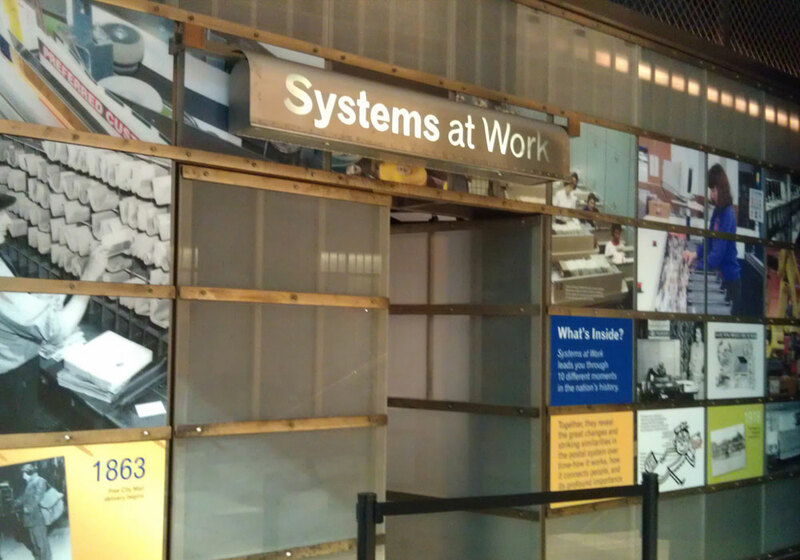 Smithsonian National Postal Museum “Systems at Work” postal exhibition’s story evolves via a chronological route radiating from a central immersive 270’ audio-visual theatre hub where visitors can compare how mail is processed and distributed during different time periods in American history. CMS was chosen to detail, fabricate, deliver and install this major exhibition focusing on the creation of a national postal network. 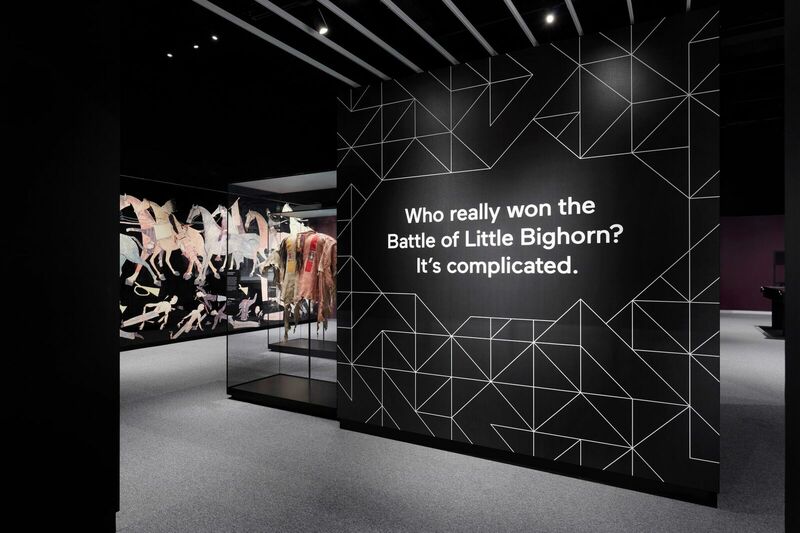 This new gallery takes over the space previously occupied by three smaller galleries and the museum shop creating a new single gallery of approximately 3,200 sq. ft. CMS was also tasked with providing the overall demolition and renovation of the space within a shortened 6 week time period. Neighborhoods and Shared Memories is a community-sourced exhibit that empowers its members to tell the story of their neighborhoods in their own words. 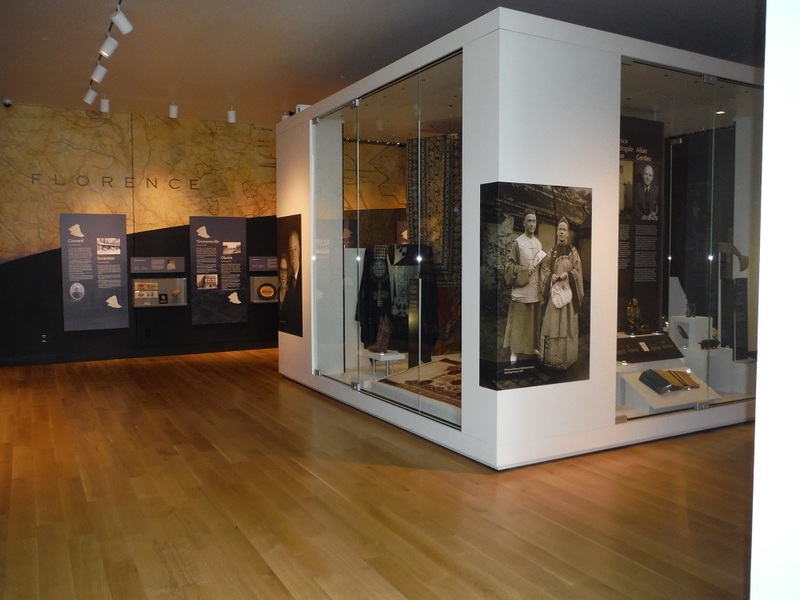 The community is the curator with guidance from the Museum’s staff. The exhibit is, partially, temporary; every 18 months, a new set of neighborhoods will be on display. 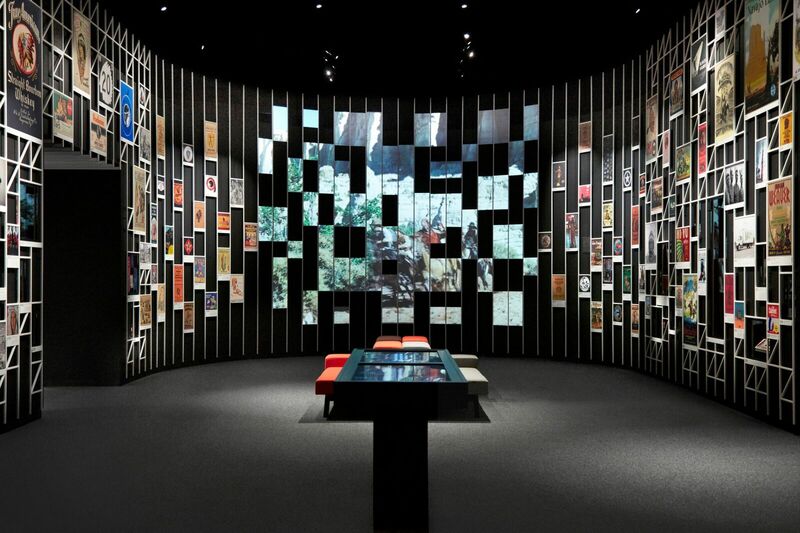 The exhibit furniture and casework is designed to be entirely adaptable to new configurations of artifacts and media. 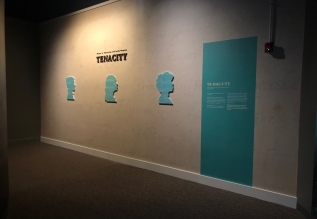 The exhibit was one of 18 exhibits selected from over 400 applicants for the AIGA "Justified" competition as an "outstanding case study."